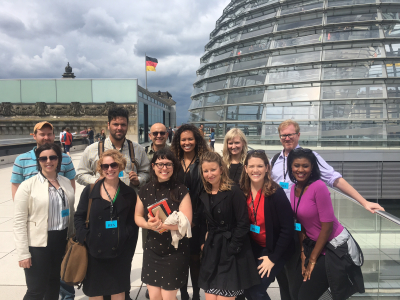 11 U.S. journalists participated in the 2-week Germany program. 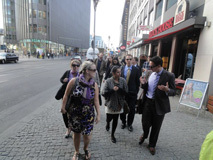 With Berlin as starting point they were also visiting Erfurt, Cologne, and the EU and NATO in Brussels. Mike Cavender, RTDNA/F, Washington, D.C.
As RIAS celebrates its 20th anniversary this year and, with it, a partnership almost as long with RTDNF, it seemed an appropriate time for me to join the current class of RIAS Fellows during their intensive 2-week educational session in Germany and Belgium. 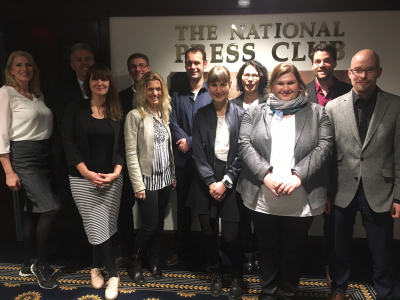 The goal of the RIAS program is to allow American journalists to get a first-hand look at the global events shaping the news and issues today in Europe. 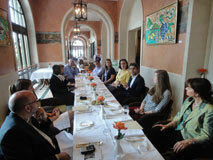 RIAS also provides for German journalists to learn about U.S. policy and media here in the states. Of course, there couldn’t be a more opportune time for our visit than now, as the Euro crisis continues to grow and fester and Germany (as the continent’s leading financial power) finds itself pressured from all quarters to lead the efforts to pull Europe out of its mess. For an economic and policy wonk like myself, I couldn’t have asked for a better opportunity to visit with German leaders, EU policy makers and just regular Europeans — all of whom are wondering how the next chapter will play out. From every indication, this group (like all those before) found the Fellowships both professionally rewarding and personally interesting. Some were seasoned travelers; some were first-time European visitors. But they all shared a common bond: to gain a better understanding of the world outside our own borders and a desire to see how those perspectives impacted the United States view of global affairs. And they came away with nothing less — and a whole lot more. From my point of view, something that I found quite interesting (and a little humbling) was a statement repeated by a number of the officials and media types with whom we met. When asked if the United States was still seen by Europeans as the most important and dominant power in the world — the answer was (politely) “not really.” You see, America — for so long the be-all and end-all on the global scene — is being upstaged just a bit by other, important powers, such as China, Japan and India. And that’s an important perspective to understand and appreciate. But there were many other lessons to learn, too. With the first week of the program spent entirely in Berlin, our group was introduced to the tragic stories of isolation because of the Berlin Wall — and the triumph of the reunification of West and East Germany. There was great comparative education provided about the policies and practices of both public and private broadcasting and how that compared with our own media. And there were valuable meetings at the German Ministry of Defense, an explanation of the Euro economy by a senior economist at Deutsche Bank and quality time spent with U.S. Ambassador to Germany, Philip Murphy, at the new U.S. Embassy overlooking Berlin’s famous Brandenburg Gate. In Brussels, we had the opportunity to spend a day at the European Union — learning first-hand what EU policymakers are facing as they wrestle with the Euro crisis. And a day at NATO Headquarters provided the group with an inside look at NATO’s current challenges with world security. But lest you think it was all work and no play: we were on the continent during the Euro 2012 Soccer Tournament and let me tell you, the Europeans take their “football” very, very seriously. It didn’t seem to matter whether Germany was facing Greece (Germany won that one, by the way) or if Croatia was pitted against the Ukraine. Any match was an opportunity to shout, blow horns and (perhaps most importantly) drink good German beer! And, in case you hadn’t figured it out — some of our number participated in that last endeavor! The cultural side trips to Potsdam (the site of the famous “round table” meeting to divide Germany after WW II,) Bruges, Belgium (a fascinating medieval town an hour outside of Brussels) and other places all combined to make for both an educational and a enjoyable experience for our group! 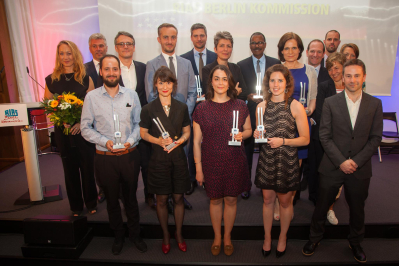 The Radio Television Digital News Foundation is proud to partner with the RIAS BERLIN COMMISSION in offering these twice-yearly Fellowships. Rainer Hasters and his staff, Lisa Ziss and Isabell Hoffman, in Berlin and RTDNF’s Jon Ebinger work diligently every year to insure everyone gets the absolute most out of this experience. And based on my conversations with those involved in the Spring, 2012 program, their track record of success remains unbroken! On the second day of our two weeks together for the RIAS fellowship, our group is gathered for our first breakfast together when an awkward moment takes places and makes me realize, the rest of this trip will be terrific and an experience of a lifetime. 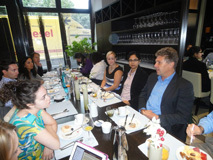 Our group was seated at the hotel’s breakfast annex meeting our first guest, Brent Goff from Deutsche Welle English television. The discussion turned to broadcast journalism in the United States, and how it compared to journalism in Europe. Completely coincidental, but it was at that moment when our RIAS leader Rainer took a phone call out of the room. By the time he returned the group had endured its first big argument and some were steps away for calling for an all out fight. I loved it. The news directors in our group took offense to the notion by some other members in our group that American television had deteriorated to this tabloid freak show that would do anything for ratings. Truth be told, we only do anything for ratings, four times a year, sweeps. The discussion, heated as it was, made me realize this is the sort of exchange of ideas, perspectives, that made me decide to take part in this experience. And to be able to do it while in the confines of Europe was even more exciting. Our next meeting for the day with the U.S. ambassador to Germany, Philip Murphy, at the U.S. embassy was a little more stately. 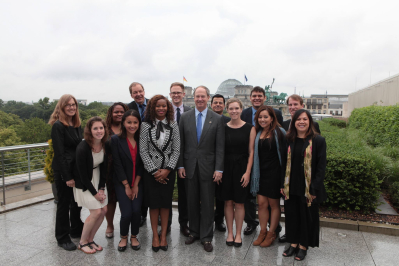 Meeting the ambassador with the backdrop of the Brandenburg gate was an experience beyond my expectations. 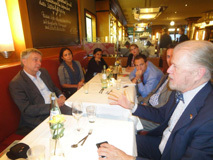 Here you had America’s top diplomat in Germany meeting with us mere journalists in a week when Greece was heading for a second critical election, the European Union appeared on the brink of collapse. It was one of those “aha” moments that made me realize the benefits of the RIAS experience. 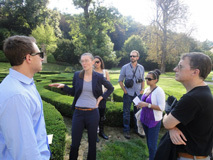 While the trip was not packed with officials on the level of Ambassador Murphy, every meeting and experience had its own, unique and fascinating take on what it’s like to live, work and play in Germany and Belgium. Just when I thought I’ve read every book, magazine article and seen every documentary that could be seen about the Berlin Wall came the walking tour on our first full day. The Berlin Wall memorial walking tour gave the sort of in person experience that couldn’t be conveyed in print or on air. The stories of desperation and death brought on by the Wall, hit home. To make the entire cultural experience complete, we were fortunate enough to be in Berlin as the Germans were playing in the first round of the Euro Cup. We walked over to the Brandenburg gate and quickly learned why it’s called a fan mile. Hundreds of thousands of Germans were gathered watching the team on big screen televisions. It was a fantastic and exhausting end to our first full day of this fellowship. Another one of the interesting aspects of this experience for me was seeing the different television studios and meeting with the different journalists in Germany. I’ve been in the television business some 15 years and have only worked in the U.S. It was great to see how others do the same thing we do. And it was refreshing to learn that there’s still a huge audience for the television business ON television. Not online, print, or through apps. I was wow’d by the RTL studios in Cologne. I could liken it only to the CNN headquarters in its immensity. 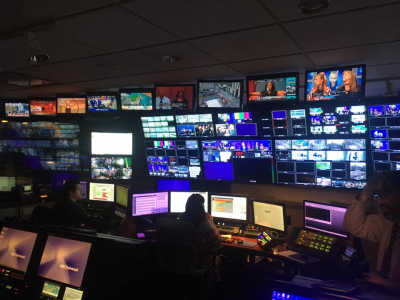 The offices were beyond state of the art, and the set for the newscast anchored by Peter Kloeppel had even my bosses back in Washington a little jealous and curious about whether it’s something we would be able to pull off. I was impressed by the sheer amount of money in the ZDF operation and the scope to their operation. Not really sure we ever had something that would compare to that sort of seemingly endless funding. And as someone who at the beginning of my career was often the only black person on the news in the smaller towns where I started, it was impressive to meet Ali Aslan, the only major Turkish journalist working in Germany. I gotta admit it was also great, randomly running into the chancellor on the way into lunch to meet Mr. Aslan at the Adlon Hotel. Again, it’s that sort of exposure that made me want to take part in the RIAS fellowship and it went well beyond fulfilling. I feel as if we got a great feel for life in Berlin, but also outside of it. We met with an official from the State of Thuringia on our very first day and so it was fitting to visit the state. It was quiet, quaint, and beautiful. Our stay in Erfurt included tours of the beautiful town, meetings with State officials, learning about its world reknown architectural school, and experiencing its classic beer gardens. Not to be outdone, Cologne quickly became one of the most beautiful cities I’ve ever seen. With its cathedral, architecture, locks on the bridge, the grand and the minute things made me fall in love with this place. I’ll be back. Our last few days in this trip were both interesting and admittedly featured some of the more lackluster speakers. But I knew it would be feast or famine at the European Commission, prior to our trip. Our day at the European Commission in Brussels couldn’t have come at a more critical time. The elections in Greece had just completed and as the Union waited to see whether the parties could form a coalition that would in essence make sure Greece stayed in the Union, we met with several officials from the Commission. I wish some of the speakers were a little more upfront about the stakes at hand and gravity of the situation, but I guess that’s why they’re diplomats. In some ways visiting NATO seemed like a trip to a fossil museum. Many Americans, including myself, are not sure why the alliance exists anymore, but it was good hearing from a bevy of speakers about the organization’s purpose in this day and age. This was my 12th trip to Europe. Yet in my combined previous four months of travel time in Europe I had not learned and experienced 1% as much as I did in my two weeks with RIAS. 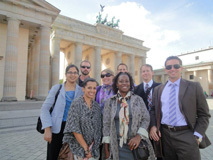 In June of 2012, my husband Robert and I were fortunate enough to be selected to participate in the German-American Journalist exchange program. As KVUE-TV’s special projects producer and newsroom manager, I could not wait to broaden my international knowledge with an emphasis on Germany. Over the past 25 years, I’ve covered many high-profile events, but none was as exciting and informative at the RIAS Spring Program in Germany and Belgium. The intense two-week course was so much more than I could have anticipated. 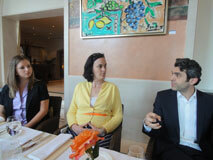 I welcomed the chance to savor a different culture with new friends who shared the same interest in journalism. I returned from the adventure with a renewed enthusiasm for my chosen profession and a broader international news vision. I also enjoy telling other broadcast journalists about RIAS and their efforts to encourage understanding between Germans and Americans. RIAS allowed me to compare and contrast the unique differences in German and U.S. journalism. Some of the highlights of this program include one-on-one conversations with newsmakers, journalists and powerful officials. 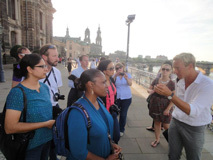 We were able to gain a firsthand look at the German culture, its past and focused future. Our visits to the Berlin Wall, NATO, U.S. Embassy in Germany, the European Union in Brussels and an intimate dinner with a German couple in their Berlin home were memorable moments that will stay with me for a long time. Our guide and “teacher”. RIAS Executive Director Rainer Hasters, made the program comfortable and informative, and he fostered a unique connection between our countries. While the European debt crisis has been well documented by American journalists, being in Germany and absorbing the full impact of the story was truly eye opening. Being there and talking to Germans gave me a more in depth understanding of the on-going crisis, beyond how it is presented in the news in the United States. This experience was of value to me both personally and professionally. In November KVUE-TV will host two German journalists for one week during the November general election. I plan to show them true Texas hospitality and provide a firsthand look at broadcast journalism in the nation’s 45th largest television market. As special projects producer, I can appreciate the long-form reports on German television that take time to develop issues beyond what is reported in nightly newscasts. 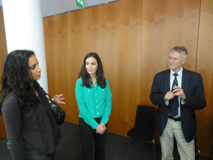 I enjoyed visiting the German television network studios and meeting their staff members. While we operate in different arenas, we share the same journalistic mission and values. In conclusion I want to extend my sincere gratitude to the RIAS BERLIN COMMISSION, RTDNA, Rainer and all of our hosts for this once-in-a-lifetime opportunity. How do you sum up an incredible two weeks on one page? For me the experience was phenomenal on a number of levels. I had visited Berlin for 3 days in 1978 and this was my first opportunity to return to Germany since that time. I suspected (like many Germans) that the Berlin Wall would be standing for at least 100 years. Thankfully the DDR is now in the dustbin of history. Of course the reunified Germany is facing new challenges. We heard first hand about the current troubles; the Euro crisis, ethnic tensions, and the ongoing problems related to reunification. Germany’s “heavy history” spanning two World Wars is fortunately not being swept under the rug. One of the many highlights of the trip was connecting with Germans on a personal level. I was fortunate enough to be on the trip with my wife Kathy from KVUE-TV — a fellow “Fellow”. We really enjoyed our “blind date” with Dr. and Mrs. Michael Groth. Michael is a reporter and anchor for Deutschlandradio Kultur. The Groths prepared a wonderful dinner for us in their beautiful home. It was my first time to sample white asparagus. It turns out Michael is a huge country music fan and loves visiting Texas! (I warned him NOT to visit in the summer — he would melt.) We talked about our jobs, families and our daily routines. The access we had to government officials, high ranking German journalists and television network representatives — even a briefing by U.S. Ambassador to Germany, Philip Murphy, at his office overlooking the Brandenburg Gate — was truly a once in a lifetime experience. Our group was stunned when German Chancellor Angela Merkel walked right by us as we were standing in front of the Adlon Hotel in Berlin. I even got a picture of her. Imagine a by-chance encounter with a U.S. President on a street in Washington — (no chance). We had a great group of fellow journalists on this trip. All had insightful questions for our guest lecturers. We started the journey complete strangers. Every one of them is now a good drinking buddy. There are so many experiences we shared that it will be impossible to forget or even come close to sharing in this space. We would like to especially acknowledge the men and women who conceived the idea of the RIAS Fellowship program 20 years ago. I truly believe their foresight is bearing fruit and strengthening the ties between our two countries. Again, to everyone connected with RIAS — THANK YOU for your generosity! Bridges span divides and connect people. They symbolize human ingenuity, beauty, and grace. In Cologne, lovers affix engraved padlocks to the Hohenzollernbrücke bridge and throw the keys into the Rhine: signifying their lasting bond. In Potsdam, at the Glienicker Bridge, East and West met halfway — if only to trade spies. Shortly after the German public brought down a wall that separated them for 28 years, a radio station in the American sector, dedicated to free expression, truth and unity, built a new bridge: not of steel but of goodwill. 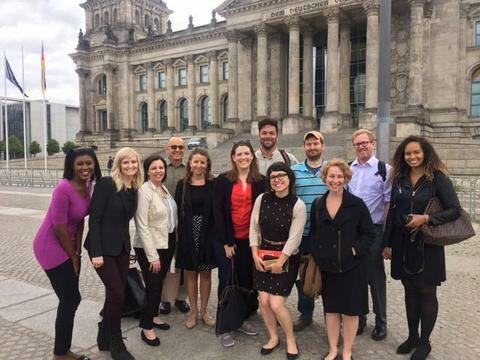 Stretching across the Atlantic, the RIAS Berlin Commission’s bridge connects U.S. journalists to Germany and vice versa through a generous and personally enriching exchange program. It’s a bridge to understanding the past and creating new relationships for the future. Today, across the United States, there are vast divisions, rifts between rich and poor. Republicans and Democrats. Blue states and red states. Christians and Muslims. People are said to be “polarized,” far apart, at extremes. 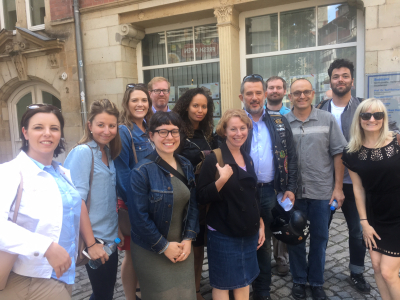 In this climate of political uncertainty, deep economic woes in Europe and in America, 10 other journalists and I, all strangers, met in Berlin and traveled together for two weeks, in Germany and Belgium, learning about what unites and separates us. The prime unifying force between Germany and the United States: English. Berliners spoke English beautifully and generously: without resentment at our limited knowledge of German. Guten Tag! Guten Morgen! I felt sorry that in my busy life I hadn’t found time to master more than a few basic phrases before departing on the trip. Once there, it quickly became evident I could cope perfectly well without it: and that made me feel ever worse. English has become the universal bridge between nations in business, entertainment, academics, technology, and politics. But could it eventually weaken a country’s native language? With an aging population and a low birth rate, Germany will need in the years ahead to rely increasingly on immigration for more skilled workers. Since the close of World War II, the largest block of immigrants in Germany, are the Turks: 4 million strong, some 350,000 in Berlin alone. The laborers came in the post-war building boom, stayed and thrived for a time. After the collapse of the Wall, however, in 1989, with reunification and the struggle for full employment, the Turks lost jobs and faced discrimination. They view it this way: The wall came down “and we are underneath,” a Turkish representative told us. Around the time of our visit, treatment of the Turks was national news. A controversial book had been published claiming the Turks were unwilling or incapable of learning German and adapting to the German culture and were draining the welfare coffers. The country, too, was still dealing with the realization that eight Turks had been murdered in recent years in seemingly unconnected acts that later were found to have been the work of a neo-Nazi cell. The discrimination and resentment is not unlike the difficulties felt by Muslims now in the United States after 9-11. One of our German hosts repeatedly referred to immigrants as “people with migration backgrounds,” and wondered if there wasn’t a gentler, more artful term. What are foreigners called in America, a country founded by immigrants? “Illegal aliens,” I said. Across hundreds of miles along the border with Mexico, the United States, which long welcomed the huddled masses yearning to be free, there are massive fences. Immigration reform is a top policy concern. In the GOP primary this year, Herman Cain proposed expanding the fence — and electrifying it. Germany knows a thing or two about restricting borders. One of my first stops: Checkpoint Charlie, the most famous border crossing between East and West Germany, where in October 1961, two months after the GDR halted free passage, American and Russian tanks held a dramatic standoff over access. A sprawling museum on the site, crammed with artifacts, shows the extreme and courageous lengths more than 5,000 East Germans took to escape alive. There were self-built aircrafts, special armored cars, mini-submarines, and hot air balloons. Today the site is a busy intersection, with an American fast food joint (McDonalds) and an American coffee shop (Starbucks). Throughout Germany, between 1949 and 1990, some 4 million people fled communist rule and political persecution. At the Berlin Wall Memorial, at Bernauer Strasse, we saw firsthand the division of a city, the remains of the towering wall, and the frightening guard tower overlooking the barren death strip with its sand pit, pointed spikes meant to deflate tires, trenches and flood lights. We saw the pictures of the young men and women, even families with babies, killed trying to get over the wall. One of the most iconic images was of Conrad Schumann, the uniformed East German pictured at the site, leaping over barbed wire to freedom in August 1961, as the wall went up. I thought about how so many in the United States take our freedoms for granted. In Florida over the past fifty years, turnout for the Presidential race has averaged about 64 percent, according to the Florida Division of Elections. In 2008, which saw Obama pitted against McCain, it was a whopping 75 percent. In local elections it is often dismal. During the most recent primary election in Florida, held in August, only two of every 10 voters cast ballots. Yet the importance of political participation, oversight, accountability and resistance to oppression and intolerance are obvious, right on Berlin’s street corners. Only several blocks from our hotel was the Topography of Terror, a museum and educational center located on the site of the most important institutions of the Nazi persecution and extermination: the Gestapo, the leadership of the SS, and the Reich security office. Repeatedly we heard in Germany that the citizens take public policy seriously. The media plays a vital role in maintaining an informed constituency: so much so that each of the country’s 36 million TV household are taxed 18 Euros a month for public TV. 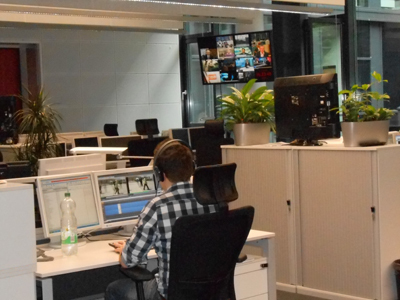 Competitor RTL, the biggest private TV station and the market leader, relies on ad dollars and caters to viewers ages 14 to 49. It prides itself on being innovative and aggressive in its news coverage, but has been accused at times of being sensational and delving into infotainment to win over viewers — not unlike the American media. Yet, Germany does not have ideological stations, akin to Fox News, we learned. Germans are not so polarized in their politics, as are the Americans, said Karsten Voigt, former coordinator of German-U.S. relations at the Federal Foreign Ministry. Among the German populous, debt reduction is more popular than tax reduction. College is largely free and graduates do not leave with heavy financial burdens. Though we learned that children as young as 10 are steered into educational tracts that lead either to trade school and apprenticeships (for example as hotel managers, cooks, waitresses, bank clerks, plumbers or carpenters) or to universities. Money does not play a great role in elections — political parties receive federal funding in proportion to the percentage of votes won. Campaign seasons are shorter than in the U.S., and the parties vying for control are of more significance than the individuals seeking office. The country has had universal health insurance since the late 1800s, instituted by Otto von Bismark, the first German chancellor. “We don’t understand the Americans concern or opposition to this,” Voigt said. Germans do not support large divisions between rich and poor, preferring to have more equilibrium and a social safety net that aids the underprivileged. All of this costs the state, however. Germany’s highest personal tax rate: 45 percent. In the U.S. it is 35 percent. Throughout the trip, from Berlin, to Cologne, to Brussels we thought a lot about our world differences: the varying types of governance, from Greece’s “red wine and fiesta state” to Germany’s austere, orderly system of forging ahead responsibly, sheltering and protecting its people. Will the United States look more like Germany under a second Obama Administration, or continue down a path of polarization, the haves versus the have-nots, in which the winner takes it all? What bridges between people will be built? Which ones will fall? Will the Euro survive? Will, or should, NATO step in to halt the atrocities in Syria? How will the sweeping changes in the media landscape affect world peace and democracy? In the early 1980s, before reunification, a painting contest was held in which artists in West Berlin were urged to draw on the wall to “overcome” it. One of the more powerful images was a drawing of a hand bearing a rose and reaching through a crack in the wall — to an outstretched hand on the other side. Very well organized beginning with the selection process. I was notified of acceptance with plenty of time to plan both personally and professionally. The travel arrangements were efficient and sufficiently flexible that I was able to tack on some personal time after the program and coordinate travel arrangements home with my wife. Nothing but praise for the planning and the hands on attention from Rainer, Lisa and Isabell. All three brought knowledge, understanding and patience to the process. There was a very good mix of structure and free time that optimized the time I spent and what I was able to do with that time. The time in Berlin particularly resonated with someone who grew up in the Berlin Wall era from “ich bin ein Berliner” and later was steeped in the John le Carre novels set there. Important memories from my younger days brought to life. There were several moments of incongruity from the carnival atmosphere of Check Point Charley to the Hyundai sponsorship of Euro Cup imposed on the Brandenburg Gate. The meetings with experts were both interesting and useful. Although I was surprised by the relative emphasis put on the immigrant question it helped understand one of the key issues Germany is facing and the relative inflexibility of both sides of the question. Living (however temporarily) in Alabama which is still struggling with race questions and increasingly with immigration questions, the discussions of immigrant issues in Germany emphasized the universality of mixing divergent cultures in any society. The evening with a German counterpart was very good. I don’t know how to efficiently put more one on one moments like this into the program but that would be my primary recommendation. The time in Erfurt was a nice balance to Berlin and Cologne giving us a glimpse of the Eastern question in microcosm plus a glimpse into the workings of a smaller, less glamorous community. The interaction with the regional television folks was also good. Cologne was good but I would have liked more time there. (I realize time is always the challenge.) The session with the network operation there was interesting. The contrast between German TV staffing and typical U.S. staffing was fascinating. I truly enjoyed stumbling on a four person crew doing MOS interviews outside the train station… a triumph of work rules over reason and efficiency. Brussels was a logical last stop given the European Union and Euro crisis that dominated the trip. The NATO session was helpful. Most of the meetings at the EU were exactly what one would anticipate from bureaucrats of an artificially cobbled together confederation. I don’t think it was surprising that one of our participants got a snapshot of several people dozing during one of those sessions. The depth of the failure to integrate and assimilate the generations of immigrants, the intractability of the problem and the impact on the entire society including education. The relative success of independent German television broadcasters given the huge financial advantage enjoyed by the state networks. The almost cliché reaction of most Germans we met with to the Greek/Italian/Portuguese component of the Euro crisis. It’s understandable but smug and not particularly pragmatic. Events since we were there seem to indicate that more austerity isn’t being effective and Merkel et al have painted themselves into a political corner. I remain grateful for the opportunity. I had an informative and thoroughly enjoyable time. Since I got back I have been singing the praises of the program and urging friends and colleagues to apply. I will continue to do so. This evening when I got off the subway on the way home from work, I didn’t have to push a button to exit the train. Until very recently, I’d spent a lifetime believing all subway doors simply opened as a matter of course. Tada! Union Square! As a type-A television producer who was born and raised in New York, I thought I knew just about everything there was to know about underground transportation — anything important anyway. Need to get somewhere? Ask me. I’ll tell you how. But until I traveled to Berlin as a RIAS BERLIN COMMISSION Fellow in June 2012, I never could have told you that in that city, subway doors will only open at your command. You’ve got to push the button. If you’d had me as your guide before RIAS came into my life, you could have been stuck riding the S1 for a very long time. 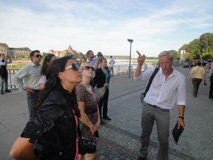 That’s what’s so amazing about the RIAS Berlin journalist exchange program. You come away with new perspectives on all kinds of things, not merely the things you were anticipating or might expect. As someone who’s scared enough of riding her bike in New York that she walks it the two blocks to the park before getting on to ride, the wide bike lanes and prevalent bike parking throughout Germany seemed revolutionary. Did you know that NATO has 28 member states and a gift shop? I do. And I find it highly unlikely that the next time I’m standing outside the Hay-Adams hotel in Washington, D.C., President Barack Obama is going to walk right in front of me. Yet that’s exactly what Chancellor Angela Merkel did to our group when we were at the Hotel Adlon. Kendis Gibson sorta kinda has photos on his iPhone if you’re looking for proof. The news cycle itself also serves as a constant reminder of our trip. The power failures that have plagued parts of the U.S. this summer have spurred questions about the wisdom and high cost of buried power lines — infrastructure that Germany invested in a long time ago. The Euro Mess seems to get messier by the day. And Olympic football-slash-soccer qualifying round matches started yesterday. Last I checked, Hyundai has no plans to stage a massive Fan Park so John Schoen and I can go watch the matches in Central Park. When I boarded the Air Train to JFK, the first leg of my trip to Berlin and beyond, it was with great anticipation and high expectations. What I did not and could not have anticipated was how thoroughly two weeks in Berlin, Erfurt, Cologne and Brussels would shake me out of my routine of the same commute with its same assumptions to the same job with the same people and the same deadlines covering, if not the same stories every day, then at least, very often, variations on the same themes. I used to think that same was good, that change and I weren’t friends. Just one more thing that the German/American exchange program now has me looking at through a different lens. None of my professors or colleagues would have ever offered the advice, “Go ahead! Mix business with pleasure!” But that’s exactly what the RIAS Journalism Fellowship was for me. It combined my love for journalism and my adoration of my German heritage. I can honestly say, going into this trip, I knew I was going to have the time of my life. Little did I know, it would be life changing. This was my second time visiting Germany, but my first in a professional capacity. I had every intention of making the most of it, by handing out business cards and networking with as many professionals as possible. I learned on the first day, that idea wasn’t going to work for me. While I find myself confident in my talents as a TV News Producer, I learned that this trip wasn’t about where it could take me. Rather it was what I could take away from it. For me, it was to be a true educational experience. My first test, was not knowing anyone. I’ve never been really good at connecting with people in a short time frame. So, I was pleasantly surprised when a Fellow “Fellow” emailed me beforehand to make plans for our first day in Berlin. My second test came after arriving in Berlin. I had time on my own and my initial plan was to be a tourist. Instead, I got lost. Literally… lost. I left the hotel with map in hand and followed the signs to the Brandenburger Tor. Along the way, a German man came up to me and asked directions. While I know some German, the speed of his speech startled me and when he realized I was an American, he stormed off… determined to find his own answer. I felt good knowing that I must look German enough to be consulted, so I should be confident enough to use my good sense of direction to get me back to the hotel. It was on this walk, when I made it back safe and sound, that I would be okay. On our first day of official appointments, I came to a quick conclusion about how serious this time was, not only for Germany, but for Europe as a whole. With the Euro Crisis holding the economy by its throat, everyone was focused on the next measured move of Chancellor Angela Merkel… all while maintaining the acute balance of power between the Eurozone as voters in Greece once again went to the polls. It was clear that Germany was the only way the Eurozone was going to survive. But none of our speakers had the magic recipe to cure all financial woes. Some agreed with Merkel’s cautious decisions, while others felt she could have done more to help at quicker pace. The same sentiment carried on through our travels to Brussels, where experts at the highest level of the EU couldn’t even come up with an equation for a solution. And while Germany is being saddled with a massive amount of debt, what struck me is that Germans don’t seem to mind. No one seems worried that Germany is having to take the lead. No one seems to care that they’re footing the bill. They just say, “This is Germany,” and have confidence that everything will work itself out. The amount of hope and resiliency I witnessed is, without a doubt, admirable. Germans have faced the difficult task of overcoming a harsh history– one rife with suffering and sorrow on so many societal levels. The Holocaust worked to eradicate the Jews off the German map. In Berlin, a wall separated not only an entire city, but families, friends, freedom and a prison. Now, the country works to make sure no one is left behind. Now, it’s as if no problems could ever surmount that horrible history. Having been in Europe before, I knew I was going to love everything about the culture and the architecture. I’ve always felt connected to the European way of life. Berlin made me realize I could live in Germany some day. I absolutely fell in love with the quaint town and the small market square of Erfurt. Cologne provided a good reminder of how insignificant I really am in the world, after climbing the 533 steps to the top of “Der Dom”. Brussels reminded me of an Old World, trying its best to catch up with the 21st Century all while being ground zero for the economic storm. Brugge allowed me to step back into time and imagine being a woman in the Renaissance. Meeting the Americans who are now working and living in Germany and Belgium (and meeting the natives married to Americans), made me realize how much of a desire I have to live overseas. Whether it’s in journalism or another professional field, I came back wanting to discover what opportunities there are for me. I am more determined now that ever, to blow all of my preconceived plans out of the water, and start from scratch. In Cologne, I shared a conversation with an older man, who talked to me about how he wasn’t smart enough to work in a professional field. He told me that his life was coming to an end but he was very proud of his son who was a dermatologist. He told me that I should practice my German speaking skills more and I should have fun on my trip. He thanked me for indulging the time of an old man. I walked away from that conversation knowing, first, that my German speaking skills weren’t as bad as I thought they were. However, I also realized that I should be proud of how far I’ve come, along with where I’ve come from. And, it made me look forward to all of the things I still want to be. When I applied for the RIAS German Fellowship in early 2012, European leaders were reassuring the world that they could manage the mounting economic and financial stresses that threatened to unravel the common currency. As the economics reporter for NBCNews.com, it was a story I had been following closely and writing about for the site. 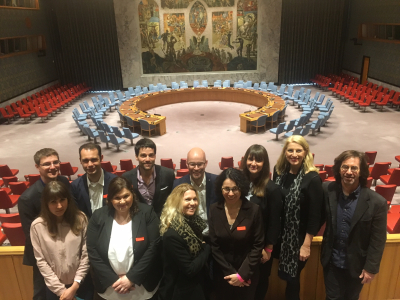 The fellowship provided a valuable opportunity to learn more about the background for the story and meet with experts and officials who could add a new dimension to my reporting. Those meeting were, indeed, extremely valuable. From interviews with officials we met in German government to the people I spoke to on the streets of Berlin, I was able to gain a perspective not available from a listening post in the U.S. Most of the coverage that reaches our readers is based on the latest pronouncements from European leaders. The real “decision makers,” though, are the people who elected them. My coverage focused on the economic impact on those voters — from the owner of a travel agency to a horse carriage driver in the Tiergarten. The divide between the reassurances from “official” Europe and popular sentiment was striking. Our visits and meeting in the former East Germany helped confirm that disparity. The lingering economic and political impact of reunification is palpable, but the American coverage of the European crisis has largely overlooked it. The trip allowed me to provide that perspective to our readers — a dimension that would not have been possible in such a short trip without the access and visits arranged by RIAS. Our fellowship was capped with a final stop in Brussels, home of the emerging Eurocracy that is often touted as the solutions to the crisis. In many ways, it is the problem. Our meetings helped clarify the source and causes of the political paralysis that has left Europe unable to reverse a deepening economic meltdown. We were also extremely fortunate to have as a backdrop to our trip the 2012 UEFA quadrennial football championship. It was both an exciting series and a metaphor for the brewing tensions among European nations. On the night Germany played Greece, I watched the match at a small bar in the “Little Athens” section of Brussels. The people I met and spoke with were eager to fill me in on their view of the ongoing standoff between Berlin and Athens over severely painful budget cuts. Short of a side trip to Greece, there was no better time or place to give voice to the Greek side of the story. None of this would have been possible, though, with the incomparable RIAS staff. The perspective, local contacts, seamless logistics and general support was invaluable. This was a working trip for me, but their added good cheer also made our short time together an awful lot of fun. 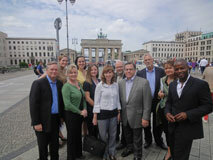 The RIAS Fellowship left me with a wealth of knowledge about Germany and Europe. The program was efficiently well thought out. The mix of discussions about German journalism and the economic and cultural issues the country faces contrasted nicely with the sightseeing experiences. Over the two-week period, enough insight was given to understand how German media works and what its future holds. 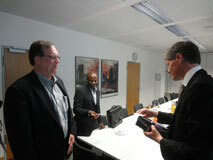 I especially enjoyed our meetings with prominent German journalists from Deutsche Welle, ZDF and RTL. Since all three networks operate differently, each guest had their own view on journalism in Germany and how it should be done. The featured journalists also spent time reporting in the U.S., which led to some interesting discussions on how a story would be covered in Germany versus how it would be addressed in the U.S. My perception is that there is a bigger appetite for international news in Germany than in America, and it is reflected in their newscasts. A cultural difference I found fascinating is that Germans seem to still be into the “appointment television” of watching the national newscast when it airs. The internet is not looked at as a great threat to news broadcasts, and thus, German networks appear to be slow to integrate their content online. I feel this lack of “immediacy” of having to post online benefits the quality of a journalist’s work, yet it doesn’t seem likely that this will be viable much longer into the future. By far, the dominate discussion topic of our trip was the future of the euro. Germany’s strong economy and stability makes the country the power player on the continent. Its government was key in the decision to bailout Greece. It was very interesting to watch how the Greek elections were covered from the German point-of-view. Germany’s challenge going forward is to press its efficiency and accountability virtues that are so engrained in its culture onto a society that has operated for centuries in a completely different way. 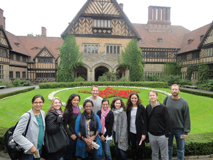 This Fellowship was an amazing way to get a real feel for the German way of life. I found Germans to be very welcoming, humble and proud of their country, despite its turbulent history over the last century. In and around Berlin, care was taken to preserve its time as a divided city. These markers serve as a reminder for future generations to show what was overcome to make Berlin the city it is today. The efficient, hard working lifestyle of Germany is even evident in Berlin’s public transportation system. I was impressed that the buses and trains ran so smoothly and punctual. Yet past that, there is a warm and friendly society. We were fortunate enough to be in Germany at the same time as the Euro Cup tournament. One of the most memorable experiences of the trip was watching Germany play Netherlands with hundreds of thousands of people gathered near Brandenburg Gate. The crowd cheered as one for Germany. And when strangers found out that we were from America, they were all too happy to include us. It was unlike anything I will ever experience in the United States and is a memory that will stay with me for the rest of my life. I especially enjoyed our visits to Erfurt and Weimar, Germany. Admittedly, when I noticed these stops on our itinerary, I saw them as time taken away from touring Cologne. But when we arrived, I was immediately taken with the charm of these smaller cities. It was great to see how Germans lived outside of the urban centers and get a feel for their way of life. It was a bit more relaxed, but had the same foundations that we found in Berlin. Since returning to the United States from my RIAS Fellowship trip, I have a new interest and understanding of European politics, culture and history. That is the main outcome of this rewarding experience. But beyond that, I take away life-changing memories and a different perspective on the world. This trip helped me discover how different things can be, yet at the core, in our case journalism, it is very much the same. I feel very fortunate that I was included in this group of RIAS Fellows and look forward to meeting more talented journalists in the future through the program. As an American of partial German heritage who had visited parts of Germany before, I set out on the RIAS adventure not quite sure of what I would discover. I was, after all, familiar with Germany through my father’s time there following World War II. His stories of a country rising to get back on its feet after two massive wars so close together had filled me with a recognition that the German people were somehow different than the Americans with whom I was growing up. My German last name gave me a special feeling of connection as a child that I wore as a badge of honor. Being German was cool, I thought. As a teenager, I was selected to participate in the Model United Nations program in New York. Each group of participants was given a United Nations member country to portray in the gathering. I was assigned to be part of the German Democratic Republic delegation. As one might guess, U.S. teaching about the DDR in 1975 was not extensive. So I rolled up my sleeves and learned all I could about this country that I considered both my political enemy and the birthplace of my ancestors. As a young professional, I was able to go to Germany for the first time after a stint supervising my university’s program in London. My wife and children and I spent nearly three weeks RVing around Europe, spending a considerable amount of time in western and southern Germany. Finally I had arrived at my ancestral home, yet I was still seeing it as a tourist. Fast forward to 2012 and my selection to be part of the RIAS contingent to visit Berlin, Cologne, and beyond. The days of childhood fascination and leisurely vacation travel were behind me. I was going to Germany as a professional to meet with professional peers and explore the relationship between our countries. The visit proved to be everything I expected and more. 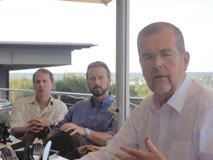 First, the timing of our visit coincided with two incredibly significant events — the continent-wide debate over the future of the Euro currency and Germany’s role in support of it and the poorer nations of Europe, and the continent-wide obsession with the Euro 2012 football tournament. While the football tournament was the source of several evenings of great entertainment, the focus did center on the Euro crisis. Perhaps more than most of the previous RIAS expeditions, my group was able to use the lucky timing of its arrival in Germany to really get more ready-to-use information for our work as journalists than I can imagine any group had ever gotten before. We had, like no college classroom here can offer, an intense lesson in European economics, continental international relations, cultural geography, and public administration expertise — a whole semester of graduate school study rolled into one intense two-week period. And while we had no sheepskin or mortarboard to show for this quasi-academic work, we did depart with an intense sense of understanding about differences many of us didn’t know existed. For myself, I now understand much more about the German home life, the expectations of students in the German school system, the inherent struggle of immigrant groups trying to capture their own pieces of the “German dream”, the uniting force of sports to transcend national borders, and perhaps most of all, the incredible resilience of the German people to bounce back from the adversities of war, separation, prejudice, and fear to build an even better nation on the foundation of what went before. Back in my boyhood, when I thought being German was cool, I didn’t know how right I was. It just took four decades and a program as good as the RIAS German-American Journalist Exchange to prove I got it right. 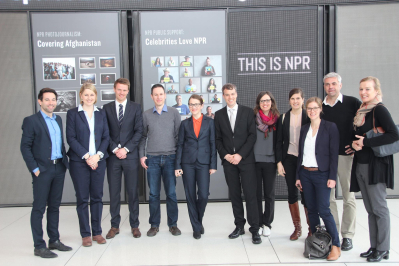 The fall 2012 German-American Journalist Exchange Program featured briefings with top-level German political, business and media figures in Berlin and Dresden, along with international media figures in Prague, Czech Republic, before heading over to Brussels, Belgium, for meetings at the EU and NATO. Walking in the streets of Berlin, along the brick paved path where the Berlin Wall once stood, my mind’s eye would often wander through all the historical events that unfolded at the very spot where the soles of my green Puma shoes touched the pavement. Just 25 years ago, it would be incomprehensible for anyone in the world to imagine the day where you could have your left foot in the former communist East and your right foot in the capitalist West, while snapping an Instagram photo on your iPhone with a mock Checkpoint Charlie security detail. From the museums to the memorials and the hallmark pictogram signals of the pedestrian crosswalks, to the stark contrast in architectural styles — it’s evident just how much Germany’s past plays a prominent role in not only where it is today, but, where it is going in the future. The harmonious integration of old and new is omnipresent with every blink of an eye, turn of the head and step. Through the entryway of The Brandenburg (Tor) Gate where Napoleon’s triumphant procession took place following the 1806 defeat of the Prussian army, the flags of the American Embassy blow in the wind, as tourists sit in Pariser Platz enjoying a Starbucks’ latte. A few blocks away, a 21st century futuristic glass dome protrudes from the reconstructed 19th century Reichstag (Parliament) building. It’s not just any glass dome, it’s German engineering at its best! Aside from being a major tourist attraction, The Reichstag dome is structured with a spiral ramp leading to a roof top terrace with a breathtaking, 360 degree view of some of the most iconic landmarks of Berlin (and might I add a great place to take a catnap). The transparent design of the Reichstag dome and its central location symbolizes Berlin’s effort to move away from its dark past into a bright, unified future. An effort that was apparent at every level of Germany society. 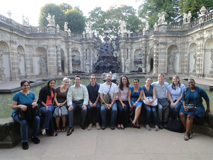 From Potsdam to Prague, through the aesthetically jaw dropping city of Dresden, down the canals of the charming medieval landscapes of Bruges, the RIAS program exposed us to a kaleidoscope of experiences. All the while, spotlighting the integral role Germany continues to play both as a leader in Europe and on the world stage. 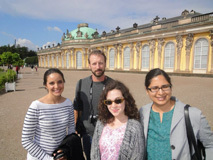 The RIAS program provided us with an invaluable cross-cultural exchange experience, giving us a first hand perspective on Germany’s past, present and future; while affording us the opportunity to network with journalist, industry leaders and politicians. The integral role that German media (both private and public) plays in not only informing but educating citizens, was profound. Through our round table group discussions we exchanged our alternative approaches to our craft, learned how news functions in Germany and how it’s disseminated to the masses. Our RIAS session happened just as the campaign drums were beating in America, leading up to the 2012 U.S. presidential elections. Everyone we encountered from the Doner kebab vendor in Kreuzberg, to the members of parliament, was not only aware of the issues affecting Americans but also had a keen interest in learning more about the inside baseball aspects of the presidential race. While in Prague, we took a trip down history lane to the German Embassy. Twenty-three years ago, the Germany Embassy in Prague was the site where 4,000 East German refugees camped out on the embassy grounds hoping to be taken by train to West Germany. We had the opportunity to stand in the very spot on the Embassy balcony where Germany’s former Foreign Minister, Hans-Dietrich Genscher’s delivered his milestone “balcony speech” which paved the way for the road which would ultimately lead to the end of the GDR. The timing of our trip to the Brussels, Belgium could not have been more impeccable especially given the turn of current world events. 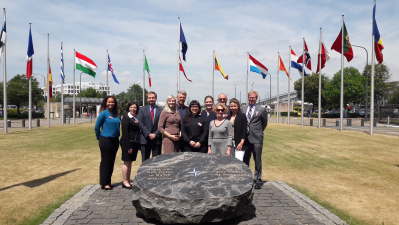 We had the rare opportunity to get an exclusive look at the NATO Headquarters and visit the European Commission, where we met with lead figures in both organizations. While Europe is in the midst of trying to come to grips with its financial crisis and NATO is making preparations to pull its troops out of Afghanistan in 2014, we were taking advantage of the economic downturn to buy Belgium chocolates at record low prices. Aside from the wonderful food and places we went, I also had the great fortune of meeting so many incredible people during my Fellowship. The kindness of the human spirit resonated through the multiple interactions we had across the country — from our lovely “blind date” dinner with our German host family; to a personal meeting with the family of a Iranian-German carpenter who served as a political prisoner of war in Iraq for 5 years during the Iran-Iraq War before eventually seeking asylum in Germany; to the fisherman at the Sunday Fischmarkt in Hamburg; these are some of the many individuals who made an indelible impression on me. The generosity and hospitality showed by Rainer, Lisa and Isabell was top notch! They paid attention to every detail and never missed a beat. None of this would have been possible without all of their hard work and dedication. It’s amazing to see how an idea that was planted decades ago by the men and women who started the RIAS Fellowship program has had such a long standing and lasting impact on journalist around the world, not to mention, further strengthening the relationship between our two countries. A BIG thank you to RIAS for this unforgettable experience and for all the wonderful memories! It was 3am when I found myself in Watergate, one of Berlin’s most popular night clubs. One at a time, men would come up to me and offer their hand for a shake or put forward their fist for a celebratory “bump”. One whispered something in my ear but it was a language I did not understand. But once I detected they were speaking Turkish, the attention suddenly made sense. Well you also have to consider the shirt I was wearing — a bright red, white-sleeved soccer jersey of the Turkish national team. The nation’s crescent and star prominently printed on the front and “ay-yildizlar” (“the crescent stars”) on the back. But it was how I obtained this jersey that was the real story. After waiting 45 minutes to enter Watergate, our group of four RIAS Fellows finally reached the front of the line, filled with a sense of anticipation and expectation. But to our surprise, the bouncers would not let me enter. They pointed at my brown dress shoes and my button-up shirt with cufflinks and said “too fancy”. And they were serious when they called it a “t-shirt club”. They would let the three girls in but not me. We exited the line, discouraged and somewhat confused. Never before had any of us been denied access to a night spot because we were dressed too fancy, normally it is the opposite issue. But before we were to leave I asked for five more minutes. “Give me that”, I said. “And I will find a shirt”. And find a shirt, I did. After popping into two different late-night convenience stores to no avail, I made a last ditch effort at a doner-kebab and pizza shop. Inside, a German man translated to five men appearing to be of Turkish descent. My request was to purchase an old, dirty, used t-shirt. They laughed at first but ultimately sold me the soccer jersey from a laundry pile they had in their upstairs apartment connected to the shop. Wearing that blatantly Turkish shirt inside a German nightclub in former East Berlin was unplanned, but also wildly important to me. Knowledge that I gained from the RIAS trip helped me understand this situation. For one, the presence of eastern and western Germans, happily dancing in one place was a far-cry from the days before the fall of the wall. The bridge, was not named after the American scandal, rather it was known as a gate between two sections of Germany, built on top of a river. And the men approaching me in the club with the high fives were likely Turkish born or Germans with Turkish roots. And I was making a statement: essentially wearing the Turkish flag in a German nightclub without hesitation. It was a statement they appreciated in a nation where German and Turkish relations can be strained and Turkish immigrants strike me as almost parallel to Mexican immigrants in the United States. Prior to my time in Germany I would not have been able to make many of these deductions. I had never visited Germany, the Czech Republic or Belgium ever before. What I knew of Germany was stereotypes. I previously pictured bratwurst, blonde beer women, the autobahn, U.S. military bases, a harsh-sounding language, lederhosen, Hitler, a foggy conception of the Berlin Wall, scenes from the movies “The Bourne Identity” and “National Lampoon’s European Vacation”. It was a shame really. Like all stereotypical notions, some of these ideas were rooted in reality but they provided me, at best, a caricature of the nation. I’m proud to say that has changed. Today, when I picture Germany, I think of Dirk Steinmetz and Marius Zekri, young journalists who are quite similar to me. One evening with them told me more about life in Germany than the previous lifetime I spent in America, basing my impressions on false pretenses and stereotypes. Today when I think of Germany I picture sites like the Brandenburg Gate, the Reichstag, Chancellery, Berlin wall and Potsdamer Platz. If I’m to generalize, I found the German people to be much friendlier than I had supposed. I did not realize that Germany looked upon the United States so favorably. Most of all, I realized that while they have their own customs and cultural norms, they are not that different than their American counterparts. 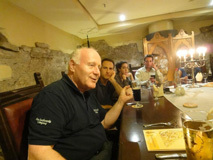 Germans like our group leader, Rainer Hasters, wowed me with their sense of humor. Others displayed impressive work ethic and ingenuity in their careers. Some showed me that beer lovers live everywhere. I left Germany with a positive impression of the government, particularly because of the willingness of so many leaders to visit with us American journalists and share information. Likewise I left with empathy for the German “political condition”. It’s a nation that rose to great power and then had a tremendous fall. Now they’ve ascended once again economically but face the delicate situation of being a financial power in a time of financial crisis around them. Germany must also deal with its Nazi history and the ghosts of the holocaust. The largest difference between the German and American media systems is the public television structure. However, I was struck by what I found to be tremendous similarity between the private German station, N24, and my station in the United States. Germans as a whole are more well-informed about global issues and part of that might be the media’s coverage of other nations. I went from knowing very little about the GDR and periods in Germany following World War II, to touring a Stasi Prison with a former prisoner and gaining more than just facts, but an actual feel for what that time was like and how people lived through the changes in the nation. Likewise, by visiting the German embassy in Prague, I was able to get an ever better picture of Germany during the post World War II and pre-fall of the Berlin wall time period. The RIAS Fellowship was one of the best times of my life. I do not throw that statement around lightly, but in this case it is true. It’s because of the blend of fun, friendship and knowledge that I experienced. In a matter of two weeks I made lifelong friends, professional contacts and gained an understanding of a land and a culture that money cannot buy. I also ended up with a Turkish t-shirt that apparently, money can buy. But the memories of that evening and the others I spent with the RIAS program in Europe, remain priceless. I’ve been trying to put this essay together for a few weeks now. It has been difficult for a number of reasons, though not the usual ones like life is keeping me too busy, or writers block, or laziness, or some combination thereof. To attempt to condense the amazing life experience that is the RIAS two week Fellowship into a two page essay is no easy feat. It is not unlike someone asking you to read War and Peace and then throw together a quick Cliffs Notes version. The extensive coordinating of logistics, paired with the ideal blend of cultural and sociological experiences and perspectives provided, the trip is perfectly organized from start to finish. By the second day, I was pinching myself and questioning how I scored such an amazing gift. I really felt like I was getting away with something. It starts with the incredible patience of the RIAS staff based in Berlin. 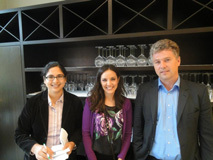 Mr. Rainer Hasters, Lisa Ziss, and Isabell Hoffmann have herding cats, er…journalists, down to an exact science. The first week of the trip is set in Berlin, a wonderful place that manages to embrace its own rich history, while also moving toward a promising future as one of the great cities of 21st century Europe. Our group spent the first day or two generally getting acquainted with the hotel, the neighborhood, the city, and each other. I could tell you all about the impressive list of people we met that week around town. Important people all, offering equally important insight to many of the triumphs and troubles facing Germany today. The switch to solar power from nuclear, the Trans-Atlantic relationship with the US, the concerns of the growing immigrant population, etc. I could write about all the amazing places we dined around town, each with a view more impressive than the last, while learning about the current state of the Euro and the pending Euro economic crisis. We also learned a good amount about the characteristics and food pairings required of a good Wit bier or Pilsner. And the list of historical sites we visited reads like a chapter ripped from a Lonely Planet book…a former Stasi prison, the Reichstag, the Brandenburg Gate, Checkpoint Charlie, the German Chancellory (otherwise known as Merkel’s Washing Machine), and of course, the Wall. About the time we really got comfortable in Berlin, it was time to head south to Dresden. The 3 hour bus ride was probably the quietest time of the trip, after the intensive week in Berlin most of us just slept and listened to iPods, stared out the window and generally zoned out and rested. Dresden had been fire bombed and virtually wiped off the map in World War II, though the residents and the German government have made a tremendous (and clearly successful) effort to reconstruct and rebuild this beautiful city. Here we happened upon a local festival next to our hotel, we had a guided tour of the main parts of town, we walked in the evening along the Elbe river, checking out the rebuilt Cathedrals and city squares and plazas. We toured one of the most impressive automobile factories on the planet (VW’s Transparent Factory where they build the Phaeton. Sorry motorheads, they are no longer available in the US). Shopping and brats and beer and discussions with economic professors and former politicians. What a beautiful place. I’ve never heard a bad thing about this city and it certainly lived up to its reputation. It is one of the most beautiful cities in all of Europe, perhaps the world. We were there for September 11th, so walking past the U.S. Embassy and seeing the flag at half staff struck a powerful chord with the group. We spent some time that day at the German embassy, listening to the history of the building and events that occurred there on the grounds. We listened to our guide as we stood in a grand room on the second floor, where we were told Beethoven had performed centuries earlier. The next day we visited Radio Free Europe and roamed around the city a bit as tourists. It was a quick visit to Prague, and then we were off to the airport for an evening flight across Europe to Brussels. 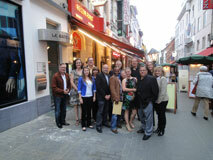 Belgium is where we would spend our last couple days of the trip together and ultimately go our separate ways. 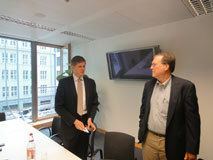 We had two days in Brussels…one for NATO and one to visit the European Union. We learned a ton. It was sensory overload of the best kind. All I really want to say in this essay is that in addition to all the obvious things that made this Fellowship a tremendous experience….the museums, restaurants, tours, various speakers, sightseeing, etc… I have come to realize it is the gradual bond that slowly but surely develops between the dozen people thrown together from all over the U.S. that really makes the trip. Those first few days, it was much more formal, cordial… whatever you want to call it. But by the third or fourth day, the laughs become louder, the jokes dirtier, the nights out a little later, and of course the wisecracks and compliments alike come from a deeper place. It is inevitable, I suppose, when you learn and visit and eat and drink and walk and hang with the same people day after day. Sometimes in life you just get lucky. As a journalist, being selected for the RIAS Fellowship is certainly one of the more fantastic experiences one can land in a career. I had several colleagues who had been selected as Fellows in years past, so I knew I was in for a treat, but this Fellowship far exceeded all expectations. I could never thank RIAS and their wonderful staff enough. And if you’re in this journalism business, and you’re considering applying for this Fellowship… GO FOR IT. It will be one of the great experiences of your life. I can’t begin to put into words my amazing experience with the RIAS BERLIN COMMISSION. I’ve learned so much about politics, economics and culture in Germany and Europe. I’ve learned more about American and European relations during my two weeks there in Europe than in my entire adult life here in America. There was so much to see. 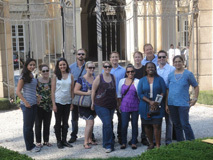 The Fall 2012 RIAS BERLIN COMMISSION trip was my very first experience traveling abroad and boy did I pick the perfect organization to start with. Just to be selected was enough to make me eternally grateful but the trip was so much more than I could have expected. I won’t try to go in order but I will mention a few of my best experiences during the Fall RIAS 2012 trip. Everything was taken care of the moment I arrived in Berlin. 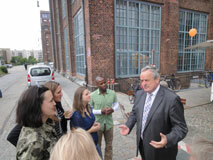 The tips given by Isabell, our gracious RIAS Berlin program coordinator, were very helpful. Pack light, have a few Euros when you arrive… etc. And RIAS took care of my dry cleaning so I didn’t have to pack too many clothes. Everything was taken care of for us. I was greeted by our host, Rainer, with a warm smile and a welcoming hand shake. He was kind, had a sense of humor, and never hesitated to answer my many questions. It was all new to me and I was concerned about looking naive or simple. But Rainer made me feel comfortable in asking anything. I had practiced my “Good morning” in German, which Isabell said was “well done”! That made me proud. And Lisa put up with our “picture taking” at every corner and made our stay enjoyable with her patience. She was “down to earth” and easy to talk and laugh with. Every hotel was elegant and comfortable and the food… oooh the many selections and varieties of food were remarkable! Our week in Berlin was exciting. The first day I met one of the RIAS Fellows, and we ventured off to Museum Hall. I spent hours at the Pergamon and still there was more to see. My hats off to the RIAS Kommission for selecting such a great crew… all eager and happy to be there to learn and grow as well. I miss those guys! When we visited the German Federal Chancellery, which I thought was the equivalent to the U.S. White House, I was blown away that the Deputy Chief of State took the time to speak with us. Even shot our first photo opportunity with him. I recall being humbled by the former Stasi prisoner who took us around the prison. I remember how he described the horrific technique with the water pails that was used to interrogate prisoners. The Reichstag was also very interesting with an incredible 360 degree view of Berlin. Sitting in the same chairs where Members of the Parliament met, that was also cool. I didn’t realize until I saw the wooden blocks on the wall just how many MP’s died during Hitler’s reign. On my own, I visited the Holocaust Memorial in Berlin. The large rectangular stones served as a mass grave for millions of slaughtered Jews. I left the memorial thinking, it served its purpose… to make people remember. I will never forget it or those murdered. Listening to the American journalist in Germany’s tales of how different things are there than in America was interesting. And finding out what Americans in the German Embassy in Berlin do everyday was interesting as well. I loved the idea of having a “blind date” where we met our German professional counter parts. That was really fun. I learned about the East and West Germany unification through our speakers and sessions. And how both physically and psychologically people were unprepared yet happy about the fall of the Berlin Wall. And how some Germans couldn’t take it when the wall went up. How so many lost their jobs, connections with their families and how so many lost their lives trying to escape. I learned about an entire town, Dresden, Saxony, wiped out by Russian “friendlies” and that it took nearly 70 years to bring the town back to what it looked like in 1945. Seeing the place in Potsdam where Hitler’s leaders drew up the documents, the plans to kill all of the European Jews, was breath-taking. I couldn’t believe the documents were right there… in black and white. And the sight seeing… AMAZING!!! I walked through king’s palaces, rode on the Bruges canal, and I can say that in my life time I have now seen an authentic Michelangelo sculpture… Madonna and child. NATO was the most eye opening learning session for me. Before, I didn’t really understand what NATO was comprised of. But I learned which countries were under the treaty and which countries are partners. I learned how Afghanistan is one of NATO’s priorities. 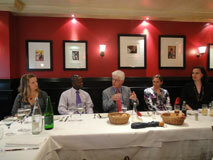 And having lunch with one of the NATO speakers and the NATO coordinator of our visit, was even better. I now have a poster of all of the countries in NATO, the EU, OSCE and the UN posted at my desk. Now when I hear stories about the euro debt crisis, or Chancellor Angela Merkel on the news, or NATO… I understand it and pay close attention. As soon as I returned to work at KCTV 5, I immediately looked up the German consulate in Kansas City. I wanted to know more about Germans in Kansas City… in the state. I discovered two sister cities to Germany in my area… Overland Park, Kansas and Olathe, Kansas. And I have made contacts for future stories about Germany. I cannot say what was my one favorite thing about the trip. It was ALL extraordinary! I celebrated a milestone birthday while I was there and was shocked that Rainer, Isabell and Lisa and my newly found RIAS friends went out of their way to surprise me with cake, chocolates and my very own beer stein. This too I shall tell to my children about my brief time in Europe and I will remind them that you are never too old to experience new things. Learning and adventure never end and along the way…you meet new friends. Thank you Rainer, Isabell and Lisa! 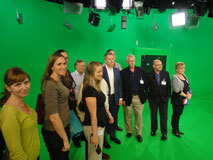 Thank you RIAS for bringing this experience to American journalists. 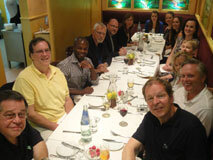 On the final night of the Berlin leg of the program, with a free evening at our disposal, a group of 2012 RIAS Fellows met in the hotel lobby to make some impromptu dinner plans. A guide book suggested that the oldest restaurant in Berlin might be a good pick (Napoleon dined there, at least by legend), and so we went off to enjoy a wonderful meal in the courtyard of “Zur letzen Instanz” on a warm September evening. After we finished, there was just enough time to walk to the nearby GDR-built TV tower, and take the elevator to the top, a final midnight survey of the city from high up. The transition between these two places vaulted us through a few centuries, from the stately old eatery founded in 1621 to the space-age Cold War tower that opened in 1969. What a marvelous demonstration of how history is stacked in layers, in places like Berlin, Dresden, Prague, Brussels. And this lesson came during an off night from the regular RIAS program! This was one of my most cherished elements of the trip: the constant reminder of how the events that determine the world today are built upon these layers of history. We heard variations on this theme from speaker after speaker, as we explored issues relating to the Second World War, the Berlin Wall, and the crisis in the Eurozone. I feel that, having grown up in Seattle, this deep sense of history was exciting—when you come from a relatively “new” place, the degrees of history in evidence in Germany and elsewhere in Europe become breathtaking to contemplate. The other exciting aspect was viewing those layers from different angles. The politicians could provide the official lines, the reporters could be counted on to give their frank appraisals, and a visit to the Turkish neighborhood in Kreuzberg provided a first-hand feeling for another perspective. For my RIAS “blind date”, I was paired with two veteran journalists who talked with real insight about a variety of political and cultural trends in Germany, from the nuances of the Merkel government to why certain TV dramas appeal to German audiences. We heard things on the record. We heard things off the record. We heard things broken down to their lucid essentials, and we heard things elaborated in dizzying detail. And we learned beyond the context of each briefing — each building spoke too, from the impeccable Chancellery, to the security-conscious embassies, the basement restaurant in Dresden with stone walls. To see the dimensions of a cell at the Stasi prison, and to hear the first-hand recollections of a victim of Stasi imprisonment, was to experience something rawer and more immediate than even the best description of such a place in a John Le Carre novel. So the immersion in German culture was noteworthy, and of course extended to eating schnitzel and drinking weissbier. But there was more. In our rounds of meeting and briefings, the talk turned, frequently, to Afghanistan, and the ongoing conflict there. 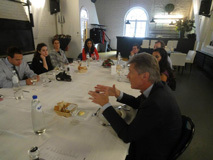 We heard much about the economic challenges in Greece and Portugal, and the delicate balance of cultures in the Eurozone. We visited the Czech Republic and Belgium. We spoke with people in the Turkish population in Berlin. The free-speech issues in Russia and Azerbaijan were discussed at length at Radio Free Europe/Radio Liberty. And mere days after visiting the U.S. Embassy in Berlin, the news was of Libya, and the attack on the U.S. embassy there. So did we learn about Germany? Yes, we learned about Germany, but in so doing we learned about the world. And I even learned more about the United States, thanks to the ideas offered by the people we met in Europe; our extraordinary RIAS coordinators Rainer, Isabell, and Lisa; and the geographically-varied Fellows in the RIAS group. And even, once in a while, from strangers: the two men hunched over a board game while we stopped by a protest tent in Kreuzberg (the protests are aimed at the gentrification of the neighborhood) looked up at our group when we began to move on, and in unison they both shouted, “Barack Obama!” Clearly the U.S. election was a large topic for many. In the group of Fellows, I was unique in not being a full-time broadcast journalist (I do a weekly radio show as part of my other activities as a writer, teacher, and curator). And it was probably a bit odd for RIAS to choose me, a film critic, as a Fellow. But the program was very relevant to how I practice my job, as I found when I talked with my “blind date” hosts, Daniel and Michael, who asked me about the radio program. The show (which I do with KUOW host, and former RIAS Fellow, Steve Scher) is devoted to exploring the “cultural moment”, a timely intersection of movies, media, politics. Daniel and Michael thought that sounded interesting, but wondered whether there was really enough to have such a topic every week. We talked about it, and then we came up with suitable topics just from the previous few days: Clint Eastwood speaking at the Republican National Convention, the anti-Islam You Tube trailer that sparked rioting, the blackly comic documentary The Ambassador by Danish journalist Mads Brugger about corruption in the Central African Republic. Sitting there in a Berlin neighborhood, halfway across the world, this idea of a “cultural moment” that ties us together seemed more relevant than ever. Speaking personally, the immersion in European perspectives and locations gave me an incalculable sense of Something Different—this valuable opportunity to be away from my own perch, and see things from a fresh aspect. And along with hearing these ideas about politics and culture, it was also the observation of an alternative to the American way of living that I appreciated. In the U.S. I often carry the feeling that I need to be doing something productive, a feeling I think derives both from the culture and from the fact of having been a self-employed professional for many years. It was wonderful to have more exposure to a way of living that values time, art, food, a long view of history—the value of sitting outside over a glass of wine and talking through the issues of the day. These moments bubbled up throughout the program (in that sense, the “off” hours, like our night at Napoleon’s restaurant, can be just as enriching as the scheduled briefings). I hope to maintain this feeling while back in the U.S. Already, I have laughed at myself for interjecting, “Well, when we were at the European Commission…” or “As they told us at the German Embassy…” in the midst of conversations at home. And the things we learned during the RIAS program truly have been useful since returning. Before I left on the program I read a recently-published volume of Ernest Hemingway’s youthful letters, and he writes home, having just moved to France, to his sister about the experience of living in Paris. And he says something to the effect that it has filled a need in him that he didn’t even realize he had until he went there. I sometimes felt that way while traveling and learning on the RIAS program—it was filling something important that I had been craving. I know I’ll carry that around with me (and attempt to share it) for a long time. I’ll be the first to admit, I didn’t know a thing about the House of the Wannsee Conference before I walked into the mansion that looked like something out of the Sound of Music. Set back deep in a forest of dense greenery, halfway between Berlin and Potsdam, the unassuming and darkly beautiful building houses one of the most important lessons for humanity. Through pictures, documents and first-hand accounts, the exhibits lay out step by step how an entire society was convinced to exterminate rather than integrate its minority population. The implicit mantra of all Holocaust education, which is the purpose of the House of the Wannsee Conference, is ‘never again’. It’s the notion that awareness will prevent a future systematic mass murder of a people for no reason other than fear of the other. As I roamed through the maze of rooms inside the House, absorbing the information emanating from the exhibits, I couldn’t help but feel as if the core issues that eventually escalated to the Holocaust seemed familiar. I couldn’t put my finger on it until I came across Exhibit 2.5: two side by side panels with excerpts from the writing of two academics in the late 19th century. As my brain processed the words, I thought to myself, I’ve heard this before. That’s when my thoughts flashed back to a couple of our speakers from earlier in the week. While completely different circumstances and centuries, the underlying emotions and tensions are the same. The mainstream German population says the new immigrants are isolating themselves rather than assimilating; while the new immigrants say German society is alienating rather than welcoming their community. This is not to say another socially accepted mass genocide is in the works; German society would never regress in that manner and the world is too conscious and proactive to ever let that happen again. However, the distrust and misunderstandings between the Turks and non-Turks is cementing the foundation for a future mass misfortune for Germany as a whole. The most obvious and immediate consequence is Germany’s ticking demographic time bomb. Because of longer lifespans and a new generation that’s choosing to have fewer, if any, children, Germany’s workforce is quickly losing people as its social security system and pension rolls are swelling. The resulting imbalance between revenue and expenses for the government and the loss of productivity could be disastrous for the country. At a time of global turmoil, from civil wars to collapsing financial structures, Germany has emerged as a beacon of stability and peace, but the demographic time bomb could demolish this accomplishment. A German society with a fully integrated Turkish population has the power to defuse this bomb. A third of the babies born in Germany now are to immigrant families, they can fill the void left by retirees. To make this potential synergy a reality, Germans need to realize that the definition of “German” has evolved through history and it is evolving once again. Meanwhile, the Turkish community has to realize when you leave your home country for another; you have to change your lifestyle to adjust to the realities of your new homeland. You can’t create a subculture that is identical to the culture of the place from which you emigrated. 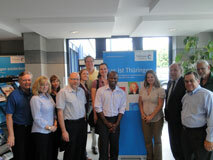 In our week in Germany, we met people from both communities who told us they are eager to mesh both societies. While their intentions are noble and sincere, it seems the two groups are talking past each other rather than to each other and that’s really progress. I hope community leaders from both sides meet in the middle and work through the complicated issues of integrating this immigrant population. There is a lot the United States can learn from Germany, but when it comes to integration of immigrant communities, Germany could use a few pages from the United States’ playbook. The fact that I was able to have this incredible experience with RIAS is a testament to what the American culture does right when it comes to welcoming foreigners. It was only a little more than 30 years ago that my father arrived in the US, literally without a cup to drink from, and worked as a dishwasher at a country club. In 3 decades he’s created a successful life for himself and his family because he was willing to become an American and his new country let him hold on to his heritage. As a product of this mutual respect, I’m surprised by what I saw in Germany, but I’m hopeful that change is on the way. The day after our visit to the House of the Wannsee Conference, we were in Dresden. As I made my way around the picturesque and seemingly quaint city center, I noticed something unusual. Despite all the history embedded in the cobblestone roads and the rebuilt buildings, which draw thousands of tourists every month, there wasn’t a single flag of Germany displayed anywhere. I heard from several people that there isn’t a lot of national pride because of the dark eras of Germany’s recent history. I was astounded by that. To me, Germany has a rich and laudable track record of political, cultural and business innovation and achievement. From the Holocaust memorials to the inlays that mark where the Berlin Wall once stood, Germany does a phenomenal job of acknowledging the sins of its past and honoring those who were harmed by them. This type of keen self-awareness of history is admirable and should be replicated with self-awareness of the present and what needs to be done to fix the current problems in German society. I hope in a decade or two, when I bring my children to Germany for a visit, we’ll be discussing how the country succeeded in integrating its Turkish population. It’ll be just one more storyline in the narrative of what makes Germany one of the world’s unparalleled leaders. While cruising in an 8-seater plane a few thousand feet above the open lands of the Schleswig-Holstein region in northern Germany, I truly began to understand how Germans have integrated innovative clean energy into their daily lives. From my aerial vantage point above acres of green farmland near the German-Danish border, I saw rows and clusters of windmills, some towering above 100 meters. I learned how farmers had come together to form wind energy parks that could harness the constant wind from the North Sea. On our descent, the plane circled around the small town of Husum, host to the Wind Energy International Trade Fair. The large Messe (Convention Hall) and adjacent tent city housing the trade fair exhibition came into view. It was quite a spectacular finale to my two days in Husum, where I’d talked directly to representatives from the biggest names in wind: Siemens, Enertrac, Vestas, along with German leaders including Peter Altmaier, the Minister of the Environment. The RIAS Fellowship gave me this rare opportunity to visit Husum and see for myself the wind farms in the north of Germany, where the country’s wind industry originated. During my visit to Schleswig-Holstein and the areas around the North Sea, I grasped how wind energy has grown from a small niche into a giant industry, and how it’s emerged as one of the hottest topics of discussion in the country. 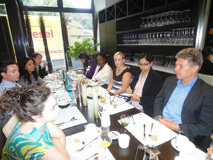 The future of Germany’s energy policy was one of the major themes of the Fall 2012 Fellowship. 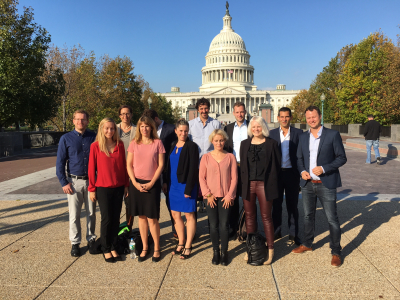 Thanks to RIAS, I was able to ask important questions about the environment directly to German political leaders, environmental experts, clean energy interest groups, journalists, and others. We heard from a wide variety of voices in Berlin, and the sessions starting on Day 1 started to shape my reporting on the topic of green energy. During Q&A’s and conversations, I learned how much Germans care about nature. Many of them told me they value clean air and energy, and they support their government’s effort to increase production of green electricity. While some voiced concerns about rising electricity costs and the government’s sudden decision to move away from nuclear energy, many were in favor of enhancing the country’s electric grid and transmission lines to help transport clean energy to high-density areas. I was particularly interested in our discussions with people in the solar and wind industries, since they carefully explained how the government is backing growth with feed-in tariffs and other incentives. During my extension, I also learned of improvements being made to undersea wind turbine installations to minimize noise and impact on wildlife. I visited a wind tunnel in a laboratory at the University of Oldenburg, where I saw a team of physicists experimenting with noise and wind speed. They’re trying to develop ways for wind turbines to sustain even higher wind speeds, especially out at sea, where wind speeds greatly exceed those on land. My visits to wind test parks in the North Sea towns of Cuxhaven and Wilhelmshaven greatly informed my reporting, and I learned how wind institutes and groups are conducting tests to improve wind turbine functionality. For my radio reports, I needed to interview local citizens who live near wind parks. I received great support from German RIAS Fellow Hanna Ender (also my RIAS “blind date” dinner partner), who agreed to help me interview townspeople one weekend. We drove outside of Berlin to small towns adjacent to wind parks, with a plan to ask local residents about their thoughts on wind energy. On a tip from Reuters journalist and RIAS guest speaker Erik Kirschbaum, we headed to Nauen, but as soon as we spotted wind turbines in the villages along the way, we decided to stop and take a closer look. We met a bicyclist who suggested we drive over to the nearby village of Hoppenrade, where we found a residential neighborhood that backed up against a field full of turbines. Hanna led me door-to-door and asked people if they would agree to a radio interview. Many refused, but a few talked on the record about their support or opposition to windmills in their neighborhood. The majority said they did not mind wind turbines, but a few local opponents criticized the noise, and said they were forced to deal with wind turbines to create energy for big cities like Berlin. I met one man there who had collected thousands of signatures for a petition against the construction of new wind parks in his area. I ended my extension in the small town of Rüthen in the western part of Germany, where a retired teacher couple took me to visit farmers who owned or were about to develop wind parks in the farmland surrounding the area. One man, a dairy farmer, talked about his dream to develop and open a wind park, but obstacles including bird groups in the area, had stalled the process. Another woman had successfully purchased a few wind turbines in a grassy hilltop area a few years back, and was already reaping economic benefits. She was a pig farmer-turned-entrepreneur, and she sat at her computer showing us records of electricity generation at her windmills. It was interesting to see how farmers have created small businesses out of wind energy production. 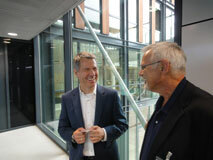 During my stay in Husum, I’d also talked to locals who had purchased shares in community wind parks. For 1500 Euros, they could buy a share in a wind park, and they would receive revenues based on energy sold to the market. In Germany, this is becoming a commonplace practice with wind and solar, and I thought about how this concept has yet to take off in the United States. 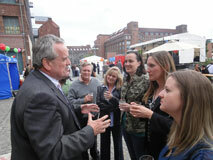 Now, I’ll rewind about two weeks back to the RIAS Fellowship in Berlin to one of my favorite cultural moments. One afternoon, all of us Fellows filled a long table at an authentic Turkish eatery in Kreuzberg, where we gorged on delicious falafels and baklava. There, we chatted one-on-one with a Turkish member of Parliament, who told us his story about rising to this position as a minority. We asked him about growing up as a first-generation Turkish youngster in Berlin, and he told us of disparities in education, housing, and other areas. Despite these difficulties, he became an MP in the Green Party, as well as a well-known figure in his community. Throughout the RIAS Fellowship, we learned of issues affecting immigration. 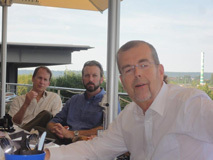 We had one particularly interesting talk on a rooftop deck in Dresden with a Saxony leader who focuses on immigration. He talked about efforts to help new immigrants become a part of the community, and explained his work lobbying to make it easier for immigrants in Germany. Before this trip, I had little knowledge of Berlin’s history, apart from the fact a wall once separated the city. But, to see the historic city up close in person made a huge difference. I suddenly became incredibly interested in learning about the divide caused by the wall, the hardships of those who were confined to the East, the sad stories of those who lost their lives crossing from East to West. As our group of Fellows walked along the River Spree with Rainer one afternoon, he described key moments and landmarks, opening up my eyes to recent German history. One of the highlights of the Fellowship was the visit to the Reichstag, the German Parliament building, where our tour guide showed us modern art that echoed some of the troubles in Germany’s 20th-century history. I was particularly impressed by the chapel of all faiths, where one could put the cross up or down depending on their faith. Another highlight included the tour of the Stasi prison, where a former East German prisoner explained the horrors faced by people confined to these small spaces for months on end. We learned of the unrelenting nature of the Stasi spies, and what drove people out of East Germany to the West during those long, difficult years. During my extension, I visited the Jewish Museum of Berlin as well as the Holocaust memorial near Brandenburg Tor, and I learned of the plight of Jews during the early to mid-twentieth century. This was almost like a historical immersion, and the exhibits taught me much more than I’d pick up from books. I saw photos of Jews in Berlin and the struggles they faced, and I understood more about how the Holocaust reached a climax under Hitler’s reign and during World War II. I also enjoyed the RIAS half-day trip to Potsdam, and I especially liked wandering through the old streets of Prague during our short stay in the Czech Republic. It’s very important to get a sense of the place by walking around outside and taking it all in, and I definitely did that in all the cities we visited (including an early morning walk through Dresden before the city came to life!). Before the RIAS Fellowship, I’d never actually been to a German restaurant. I didn’t even really know what German food consisted of, except for sauerkraut and sausages. But, in Germany, I was exposed to a diverse array of food, from Italian-inspired dishes to delicious egg dishes and vegetables, and incredible German breakfasts. Some of my best memories involve sitting at a café with my RIAS colleagues having a slice of German cake or eating a hearty dinner at Berlin’s oldest restaurant, Zur Letzten Instanz, also famously Napolean’s hangout. Here, we imagined the days when Napoleon and his cohorts used to drink the night away at the table near the oven. I learned of German hospitality at an old tavern in the small village of Rüthen with a German couple (my mother’s friends) who hosted me at their house for the night. I learned of Germans’ warm nature and cheerful attitude when I dined with German RIAS Fellow Hanna Ender at a hidden, ultra-modern restaurant on the top floor of an East German warehouse adorned with graffiti. I learned of it at the Turkish falafel place and during the sumptuous dinners we ate in fancy Berlin restaurants. This trip really helped me define German culture, political sensibilities, and especially the country’s forward-looking stance towards issues like health care, education, climate change and energy policy. As a journalist, I’d like to inform the U.S. public about many of the things I learned, and especially focus on Germany’s environmental policies as the country moves full steam ahead with its plan to boost green energy in the coming years. 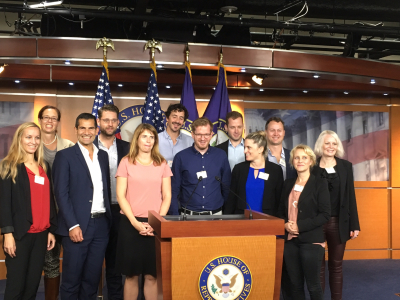 This is one of the best Fellowships I’ve ever been part of, and in a short amount of time, I learned a great deal about German history, politics, culture, environment, immigration, food, business, and more. Every detail was taken care of, from our tours to discussions with senior politicians and journalists. Rainer, Isabell, and Lisa made sure we were well informed about all the topics at hand, and I thank them for hosting me on this amazing program! No matter what I could have imagined from the RIAS Berlin trip before getting the opportunity to visit Germany, it will never compare to the real thing. The RIAS program was one of the most amazing experiences I have ever had, and an incredible opportunity as a professional journalist. I couldn’t believe how many high-profile government officials took time to talk with us about different issues. 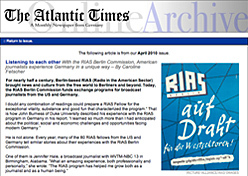 If the goal of the RIAS BERLIN COMMISSION is to promote German-American understanding in the field of broadcasting, they far surpassed their goal. I felt I learned so much about German culture, politics, history and journalism that I came away as a journalist wanting to follow news about Germany all the time because I now feel I truly understand the issues there and what is currently going on in the country. And it was so exciting to learn! The thing I learned that made the biggest impression on me — and surprised me — was how much Germany appreciated the relationship with the United States. I was not expecting this. I have traveled to other parts of Europe before and have found some European countries have a disdain for the USA and they don’t want America to be a world power. So I was pleasantly surprised to learn how much Germany valued America. Everywhere we went, our speakers told us how important the relationship was between the two countries and even how important it is for the U.S. to maintain its role as a world power. Mr. Eckart von Klaeden at the Federal Chancellery told us, “I don’t want to think of a world without a strong United States.” He said the U.S. leads the other countries and although America is often criticized for that in Europe, Germany relies on the U.S. for that. David Schwake at the Federal Foreign Office said the U.S. is Germany’s most important partner outside Europe and that Germans want to be on the same side as the United States. Journalist Thomas Habicht told us how U.S. presidents coming to Berlin made a difference to the German people and how the U.S. played a key role in German unification. Bundestag parliament member Hans-Ulrich Klose said he preferred the U.S. as a western leader rather than other countries like China or the Soviet Union. He emphasized how Germany is a major trading partner for the U.S. and said if the U.S. continues to contribute to the German-American relationship, he was not afraid of the future. All of these comments together really made an impact on me in a very positive way. It made me feel appreciated as an American there. And it made me want to do my part to continue this good relationship between Americans and Germans. Another thing I really valued was learning the history of the country firsthand. In school growing up, I obviously learned about Germany’s Nazi regime and the fall of the Berlin wall, but being there in Germany made it real — and made me want to learn more about what happened. The history became something I could identify with because all of the sudden I realized it happened to real people all around me — and not that long ago. That was impactful. One of my favorite things we did was visit the German embassy in Prague and learn how the East Germans came there to escape the GDR. The video we watched was extremely poignant because it was real footage of people doing everything they could, even risking their lives, to escape their government. In America having freedom is something we often take for granted and we forget that other people across the world haven’t had those luxuries. Seeing that footage was emotional for me and just drove home how much the German people have been through and gave me even more respect for them. I really appreciated all of our outings that taught us more about Germany’s history, like visiting the Stasi prison and even seeing the House of the Wannsee Conference in Potsdam where horrible atrocities were planned. Even though it was often horrible history we were learning about, I appreciated that Germany keeps these sites as remembrances so no one forgets what happened and people across the world can make sure these kinds of things never happen again. After experiencing that history on a closer level, it was really interesting to learn through our speakers how the country’s history shapes its decisions and its future. This is something I never would have understood before this trip. Three different speakers talked about how the idea of reducing debt in the Euro Zone by raising inflation would never work in Germany. Reuters journalist Erik Kirschbaum told us why: Germans learn in school that high inflation led to high unemployment, which led to a dictator (Hitler) taking over the country, so to this day Germans don’t tolerate high inflation. Hans-Ulrich Klose said if Angela Merkel would accept an inflation rate of 3-4%, she wouldn’t be re-elected because “Germans are more afraid of inflation than anything.” I also learned how Germany’s history plays into other issues facing the nation. Kirschbaum talked about how “bugging” devices in criminal cases are a hot topic in Germany because after its Stasi history, Germans are very wary of the police having this kind of power. And he mentioned that because Germans have been plowed over in the past, they now stand up for themselves and protest and stop any kind of projects they don’t like, for example wind turbine transmission lines near their homes. The woman at the German embassy in Prague who gave us our tour also implied that because of its history, Germans see the EU as a peace mission. She said Germans think of the EU in terms of friendship, implying that Germany’s history makes them want to unite with those around them. And on top of all this, it was really fascinating for me to learn how Germany’s history has played into German pride in their country. At first it shocked me to learn that Germany hasn’t traditionally had this kind of national pride that Americans have. Coming from America, I couldn’t imagine someone not being proud to wave their flag and sing their national anthem. But I learned that until recently most Germans didn’t even know the words to their national anthem. When I thought about the reasons behind it, it made sense. But it surprised me because I had an American view and thought everyone must be like us. As for news, it was interesting to learn the differences between Germany and the U.S., including their public-private news system and how public stations are funded with a monthly mandatory fee for households having a television and radio. And I thought the “date night” with a German journalist host was a fantastic idea. This was a highlight for me and a great way to get a glimpse into journalism in Germany. Overall, I definitely got the impression that German journalists have more of a boundary of privacy than American journalists. Germans will not go after the private lives of political figures like we do in America — and the journalists at ARD even mentioned they were surprised to find out how American journalists can access a person’s criminal records so easily in the United States. In the U.S., I would say knowledge and information and the quest for truth are considered more important than privacy, whereas the Germans sometimes value their privacy more. (And again their viewpoint makes sense with their history.) But the most interesting thing to me was how much Germans like and follow the news. In America, newspapers are dwindling in circulation but in Germany, people still like to read their morning paper. And the fact that public stations that cover mostly political news have slightly over half the market share emphasizes the German appetite for staying informed. I found it to be a very political country and the people were not only interested in German news but American news. The people at N24 mentioned they did extended coverage of the Colorado shooting — outside of regular news times — which fascinated me. I’m not sure the U.S. media gives the same amount of coverage to what’s going on in other countries. I was also surprised by how closely the Germans followed American politics. German politicians and regular citizens all talked about President Obama and the American elections. It was fun to see how informed they were. Overall, I realize now that I went in to the program comparing everything in Germany to my own experiences in the United States — and that’s why I was often surprised when German experiences didn’t mimic those I was used to. There were so many examples of this: the lack of religion in the country surprised me because that’s not what I’m used to in the United States, and the way citizenship was defined, especially with the immigrant populations like the Turks, was surprising because it was so different from the way we define it in America. But learning about all of these differences — and similarities to the United State —- is what made the RIAS program a phenomenal learning experience. I learned to think more globally. The program gave me a greater appreciation for what is going on in Germany and the rest of the world — and how Germany and the United States play into what’s going on in the rest of the world. And that was an invaluable experience for which I can’t thank RIAS enough. I highly doubt any words I write could ever really do the RIAS experience justice. It all started when co-Fellow Shanda got on the little bus that took us from the plane to the terminal in Berlin and said, “Shoshana?” She introduced me to another Fellow — John — at baggage claim — and I thought — I’ll get along with these people. Then in the hotel lobby, Rainer pulled out some maps for us and started circling the hotel and the places to go and the walk we could take. And he gave us our passes for the subway and bus system and told us to make sure we validated them — but only once. And he told us where to get our laundry done. Somehow, I knew it was going to be a good two weeks. Regardless, something about her reminded me of myself when I was her age. Something about the entire night — reminded me so much of home and made me feel so welcome. It was exactly what I needed at that exact moment in time and I felt so grateful to be where I was. The entire two weeks were hard to believe. I stopped so many times and wondered — how’d I get so lucky? Is this really happening? To see cities I’d never seen before. And meet with people I’d never have the chance to meet with otherwise. To see pieces of the Berlin wall… displayed like artwork across the city. I remember when the wall came down — I was a kid in school on Long Island in New York. And I never thought — I really never imagined — that years later I would go there and see the aftermath. Nor did I think I’d be there in such a capacity. Invited on this Fellowship, with other journalists, given the chance to learn about Germany’s history and the current issues in Europe. Speaking of the current issues. In my job — I read about the Euro Crisis all the time. Sometimes, I write about it. There is nothing like getting to listen to what people on the inside have to say about the crisis they are dealing with. It put everything into such a clear perspective for me. To hear them talk, using the words I have written so many times, but that have meant so little to me. I feel that since my visit — so much of what I cover in connection to Europe makes so much more sense to me. They say it is best to write what you know. That’s not to say I “know” the euro crisis. But I am much closer to knowing about it than I was before, all thanks to RIAS. And then there is the history. Which is pretty dark. As a Jew, it was interesting to visit a country where — had I visited several decades ago, I most certainly would not have been welcome. That horrifying history — could happen anywhere — to anyone — at any time. If people look the other way and let it happen. And while we were in Prague — the flag outside the U.S. embassy was at half staff for September 11th. Reminding me of the worst day I — and so many people in modern history — have ever seen. And then there was the attack on the U.S. Consulate in Libya. And as I drank a cappuccino while taking in a gorgeous view of Prague, I am pretty sure something awful was happening in Syria. Which brings me to Radio Free Europe. 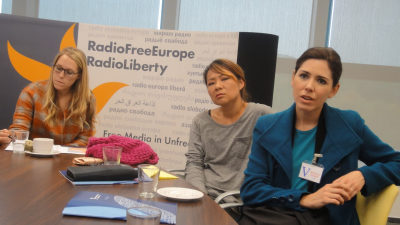 I loved by visit to Radio Free Europe and hearing the stories from the journalists who work there. The explanations of what they do and how they do it — and most importantly — why they do it — were truly inspiring. It reminded me of why I wanted to work in journalism in the first place and inspired me to do more in the future. Because it’s our job to make sure stories are told that need to be told. And to make sure the truth reaches people everywhere — even when others try to silence you. Berlin, Dresden, Prague, Brussels and Brugge were beautiful. The places we saw — from the Reichstag in Berlin to the VW factory in Dresden to NATO headquarters in Brussels. And having the chance to sit in on a press conference at the EU. It was surreal. Not to mention, the food was amazing. The weinerschnizel and the green beer I drank and the waffles in Brussels (I didn’t have the mussels) and the chocolate — all of it — fantastic. But in each city — there was one thing that remained the same, and that would be the people I was with. I am so grateful to RIAS for inviting me on this journey. For giving me the chance to visit countries I had never been to — and for letting me share those experiences with people I wouldn’t otherwise have been able to meet. 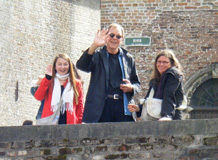 Of course — the trip would not have been the success it was — without Rainer, Isabel and Lisa. They make the Fellowship what it is. They pour their hearts and souls into the work they do and I am grateful to each of them for the help they gave me along the way. And as much as any trip to Europe is likely to be a blast — this one was so much more than that. It wasn’t just fun and it wasn’t just interesting and it wasn’t just an escape from my life. It reminded me how big the world is. And how much is out there. It reminded me that anything is possible and that even when there is unimaginable evil in the world — not just in history — but — right now — there is still so much beauty. It’s just important to make the effort to find it. When I first learned of the RIAS fellowship in an email from RTDNA, I felt conflicted. I wanted to experience this program. However, could I really spare two weeks away from the newsroom? This program benefited me, and therefore our newsroom, more than any two weeks of the daily grind ever could. I could give no higher recommendation for the RIAS fellowship program. The experience for me really began during the research phase. My knowledge, and interest for that matter, was limited to what I learned in a classroom. The term “euro crisis” was just a headline our newsroom often ignores on the AP wire. 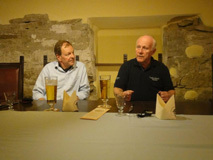 I knew Germany had good beer and was home to Volkswagen, a major employer in our city. The depth of my European knowledge was pretty shallow. I figuratively dusted off a few history books (aka Google) and then followed current events in Germany and Europe (aka Twitter). The thrill I felt on the morning RIAS announced my acceptance was only trumped by the experience itself. It exceeded in every single way. Berlin is a city that does not try to hide from its dark past. It has every reason to want to avoid those chapters in history. However, it uses that history to teach and remind people where they do not want to return. What surprised me most is that buildings are relatively new when compared to other European cities. 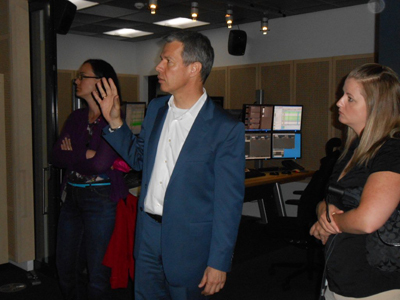 Public television in Germany is a much bigger player than it is in the U.S. We visited the publicly-funded ARD headquarters. The building is a showplace. And, the German taxpayer paid for it; citizens pay 18 euros per month to fund public television. We later visited N24, the #1 private television network, and it reminded me more of a newsroom the way many of us know one. Public television ratings dominate the ratings for private news channels, which is the opposite for American broadcasters. Our visit to Germany coincided with the final eight weeks of the U.S. presidential campaign. 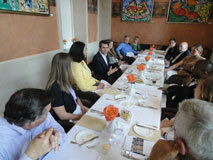 Many lawmakers and business leaders wanted to discuss the election with our group. Their estimates for Obama support among Germans ranged from 70-80% supporting his re-election. The reasons frequently given were a mix of: health care, bank regulation, and climate policy. My final day in Berlin allowed me a few hours to visit the Topography of Terror and large piece of the Berlin Wall. It was the perfect way to say goodbye to this city. From Berlin, a bus carried our group to Dresden and the home of Volkswagen’s Transparent Factory. The city of Dresden is beautiful and looks more like old Europe even though the buildings are relatively new. The allies destroyed much of the city during WWII and it has been rebuilt with an ode to the past. 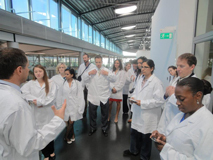 Our group’s tour of the VW factory allowed us to see where VW builds $100,000 Phaetons by hand. VW only produces 48 of these cars per day, instead of the hundreds that come from typical car plants. The access that VW granted to our group is the same white glove treatment that a new owner would receive. The most frequent customer is from China, and many of them show up to pay with cash. We say goodbye to Germany with a bus ride across the border to the Czech Republic for our one-night stay in Prague. The beauty of charm of this city was worth dodging a few tourists. Seeing the American flag at half-staff on the U.S. Embassy in Prague reminded us the date was September 11. 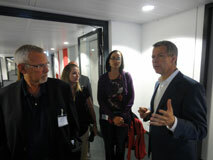 The official visit to Radio Free Europe in Prague served as a highlight for me. It really put our jobs in perspective. We visited embassies, government buildings, NATO, high-profile private businesses, and none of that security compared to the security at RFE. That was my first indicator of the important work taking place there. The RFE journalists work in the most dangerous places on earth to spread the message of liberty and to give a voice to democracy. Journalists are intimidated, kidnapped, murdered, and have their families threatened for exercising a basic American right. The final leg of our fellowship took us on a short flight from Prague to Brussels. The vibe of this city reminds me a lot of Washington DC. It is considered the capital of Europe and certainly has that feel. 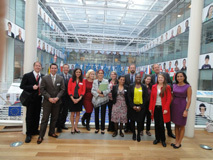 Our full-day visit to the European Commission was like a crash course in European politics. It was extremely beneficial. The internal power struggles and move toward a federation of nation states make me wonder whether history will look back on this period as the key beginnings of a true United State of Europe. Many things have to happen between now and then, but it took more than 100 years for the USA to go through this process. It is complex, and the current EU is not completely unlike the beginnings of the USA. The EU flag flies over many buildings in Brussels next to the Belgium flag similar to the way the U.S. flag flies next to state flags here. The visit to NATO did much to help me understand its true role in the world and the U.S. role within NATO. Even though the U.S. funds 70% of NATO’s budget it has no more voting power than the other members. Of course, the U.S. has influence but its voting weight is the same as the smallest nation in the alliance. The American perspective is that the U.S. runs NATO. However, as a visitor to this building and interacting with the officials it truly felt like a multinational alliance. Our final day as a group was free time in the beautiful medieval city of Brugge, Belgium. Time has stood still in this place. What a wonderful way to end the trip. 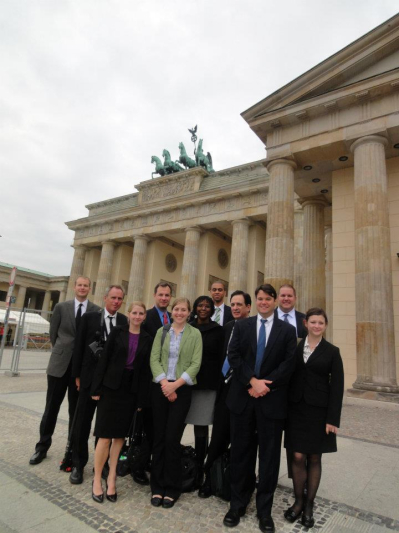 The RIAS fellowship changed my perspective on Europe and its role in American politics and business. We have no better allies in the world than the friendly nations in Europe. Sometimes it feels like a one-sided friendship here. Europeans on the street want to be friends with America, but many Americans on the street seem much less interested in affairs outside of their borders. 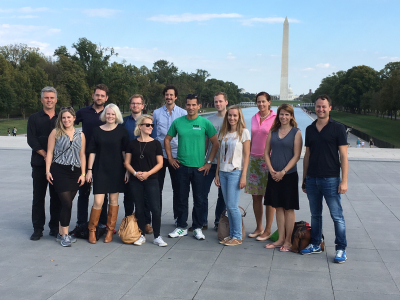 My eleven American travel partners and three German hosts made this exchange program exceed my high expectations. 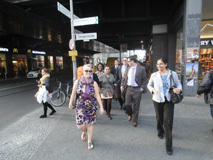 I learned from each person on the journey and felt the warm hospitality of our German hosts. Rainer, Lisa, and Isabell were more patient than we deserved. Their pride in the RIAS program and their country was contagious. Azadeh, Beau, Erika, Heather, John, Robert, Shanda, Shoshana, Sonia, Tonya, and Waliya brought me more laughs and more enrichment that I could have every predicted. Information is power. Radio in the American Sector, RIAS, was born on this philosophy in Germany after World War II. United States authorities helped create a way broadcast truth across a divided country on the foundation of pure journalism. Although the Soviet-control of East Germany resisted the popularity of RIAS, it remained a strong avenue for objective news on both sides of the Iron Curtain. Although RIAS has evolved as a program, its core purpose remains the same: unity between two global economic and political powers. It provides a way for American and German journalists to gain understanding of each other’s culture, politics, and professional storytelling through a first-hand perspective. 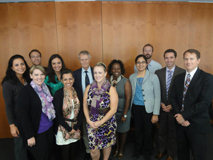 Carefully selected RIAS Fellows were given an opportunity to meet several German and European leaders. Many of them gave eye-opening perspective on how the entire world is affected by decisions made in the United States of America. Americans care most about our nation’s economy, unemployment rates, and gas prices. The global community cares about those things too, because the effect ripples beyond the border of the United States. At home, politics are talked about in the main stream media and among certain colleagues, but taboo to bring up in casual conversation for fear of an argument. Traveling abroad, it doesn’t take long for people to openly speak their mind about American politics. It’s not just opinion, it’s factual information and knowledge about specific policies and issues. “How do you feel about your President, George W. Bush?” This was a question asked to me by a twenty-something German man making small talk before boarding an airplane in 2005. I was taken off guard that a stranger would bluntly and casually ask about such a politically charged topic. I responded with a superficial answer, followed by a half smile. Exposed and humiliated, I immediately realized how little I knew about America’s political impact outside of the United States. This young man went on to talk about specific bills being debated in Washington, D.C., and the impact those specific issues would have in Germany and Europe. Issues, until then, I had only seen through the eyes of an American. This young man was educated about these issues from school, his family, and the media. I think his awareness can be used as an example for all Americans, young and old. While speaking to our class of RIAS Fellows, most politicians, journalists, and diplomats didn’t hesitate to give their opinions on the U.S. presidential election. Depending on their interests, they shared which candidate would best serve them and why. Foreign policy had little influence on American Voters in the 2012 presidential election. CNN’s exit poll results showed only four percent of voters called it the most important issue. Most American’s care about what’s happening at home, not what’s happening abroad. I learned through our stops at NATO, the European Commission, Radio Free Europe and beyond that some of the most anxious to hear who would reign as the next U.S. president were not American citizens. Many with a lot at stake in the election didn’t have the right to cast a vote. It’s not their country. It’s not their leader to choose. They cared, because the results will directly and greatly impact their future. 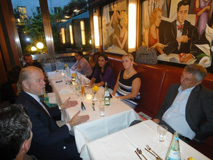 In a discussion among American and German journalists, we discussed topics dictating our news broadcasts. We found international stories are more aggressively covered outside of the United States. When it is covered, it’s typically broadcast at a national network level. Most of the 2012 RIAS Fellows working at local affiliates agreed we often cater our news broadcasts to the kind of news our viewer wants—not necessarily needs. We write abbreviated versions of the story, because of time constraints and the average attention of the viewer. The story telling philosophies of the German journalists we spoke with varied, depending if they worked in the public or private sector of broadcasting. Since public stations, like ARD, are funded by the government they must fulfill an order to entertain, inform and educate. Their stories are often chosen by political news and happenings of the day, from a domestic and international perspective. ARD correspondents Peter Mücke and Gabi Kostorz tend to cover more social and political issues, like government policy, family issues, and healthcare. Since the private sector is funded at the mercy of advertising, they are fighting for viewers. As N24 deputy chief editor Ronald Warin explained, they must delicately weigh what news is important versus what viewers want to see. RIAS was a reminder to me how important and powerful our role as members of the media is. It has forever changed the way I weigh the value of a story. A lesson I will pass on as I mentor other broadcast journalists. 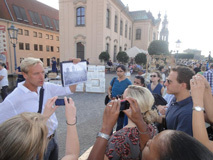 When I first received word I had been chosen to participate in the Fall 2012 RIAS BERLIN COMMISSION Fellowship, I made a promise to myself — I would document my entire experience while abroad. They say hindsight is 20/20 but I didn’t want my moments from this trip distorted by a glossy recollection of what happened. I wanted to be in the moment and capture those moments in words and pictures. And I did just that, blogging the entire two weeks, even if it meant staying up until 2 AM when we had an early morning ahead. Looking back, I am happy I did because every time I reread those genuine reactions, it brings me back all over again. Two things struck me in thinking back on my time abroad — the first is perspective and the second is dichotomy. Let’s start with perspective: this program did an excellent job of changing our perspectives as journalists. When we started, we looked at Europe from the perspective of an American. When we left, we looked at Europe from a world perspective. On one of our final days, we visited the European Commission in Brussels and this change of perspective was beautifully illustrated in a sculpture there. In the lobby, there’s a display of all 27 “member states” (countries) in the EU based on population size all lined up in a row. But when you stand at the end and look through a peephole, you see them all as one cohesive unit. It was a great visual for what the EU really is — a collection of sovereign nations that act together in the best interest of the collective. It’s also a great illustration for what I learned on this trip — what you see and how you interpret it depends on your perspective — both physically and mentally. Every person, every meeting we had, helped develop, shift and grow my perspective. Living in the United States is privilege, for sure, but I think sometimes it can be limiting because we aren’t just an hour away from another country that speaks another language and is run by its own government. Being in an environment like that forces you to be more open-minded because diversity is all around you and I learned more than ever to appreciate, not fear, something I may not at first understand. The other thing that struck me was dichotomy: the dichotomy between old and new, historical and modern, past and present, East and West, cohesiveness and independence, assimilation and diversity. To quote my own reactions from my blog while in Berlin on our first full day, it was interesting to “witness what really is a sprawling city with lots of construction and innovation alongside all the history and classic architecture. All you can hope is that the history isn’t lost as progress is made.” When I stood on either side of the plaque that marked where the Berlin Wall stood less than 25 years ago, it really hit home that what is now history is only our recent past and we best not forget what got us to that point because the moment we do, it can happen all over again. It’s just another example of how your perspective can change — in the United States, we aren’t surrounded by 500-year-old churches or palaces. When you see these majestic structures in person, in the midst of modern architecture popping up, you experience that dichotomy every day. Having the honor of participating in this program changed my life. I met some amazing people with whom I traveled Europe and others who are leaders in their respective fields taught me professional and lifelong lessons along the way. I took home with me an experience no book or website can ever come close to matching. On top of it all, I grew as an individual: “I’ve always known I’m German but being here in this capacity, it’s really hit home for me that this is my heritage and I just feel it here.” I feel privileged to have taken part in this amazing opportunity and urge other journalists to learn all they can from meeting such a diverse and knowledgeable group of individuals at home and abroad.